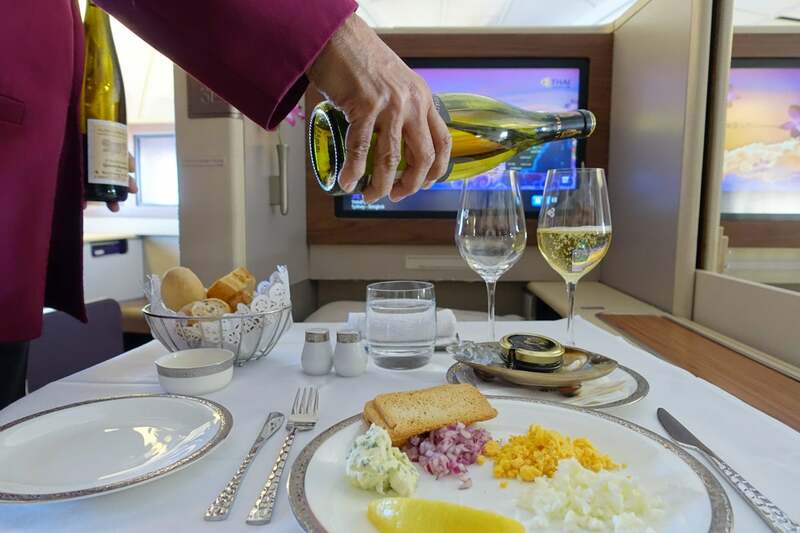 An exceptional redemption and empty first-class cabin made this long-haul experience even more special. 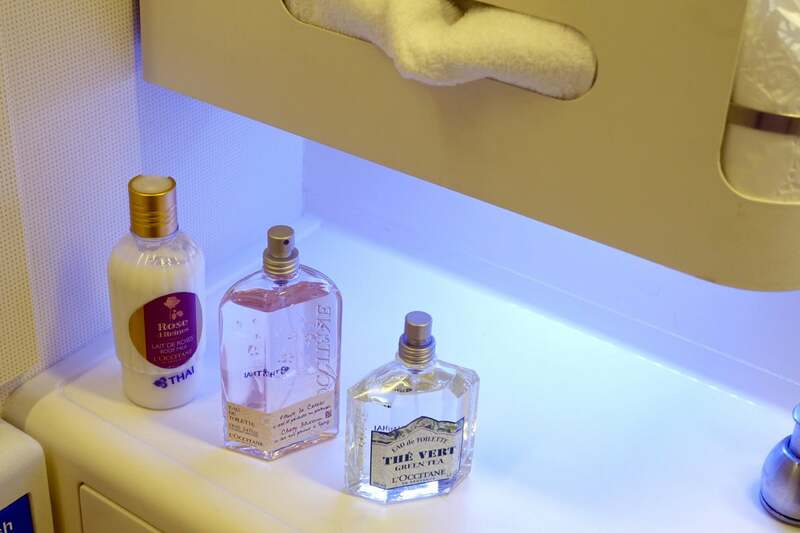 The pros: unbeatable value, comfy pajamas, Rimowa amenity kits, turn-down service and top-shelf liquor. 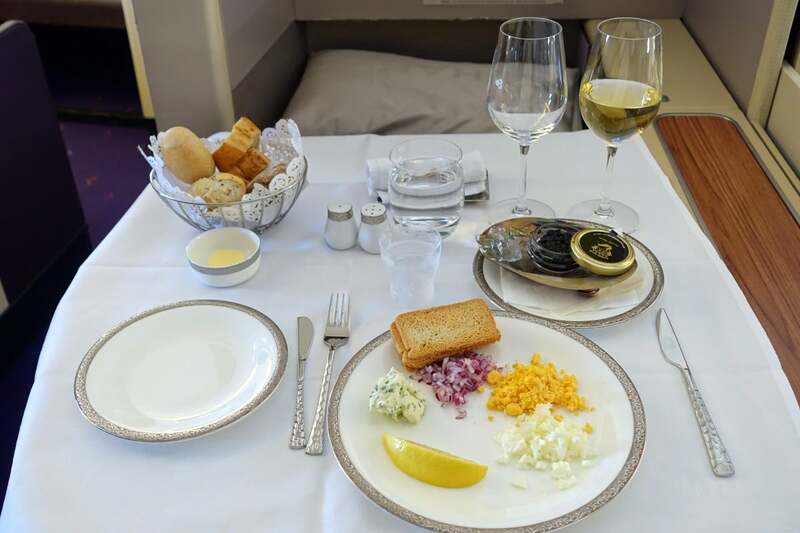 The cons: underwhelming entrees, in-flight entertainment issues, no Wi-Fi. 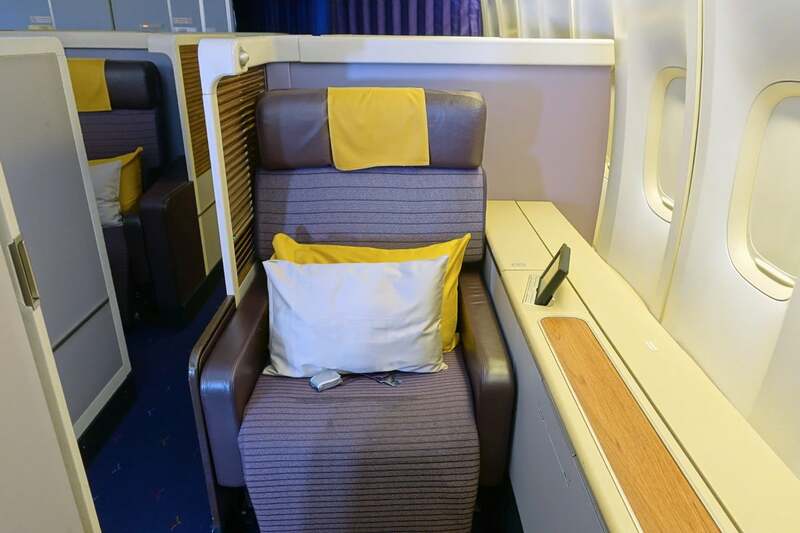 Considering you can get nine hours in Thai first class between Sydney and Bangkok for almost one-third the cost of a similar redemption in Lufthansa first class between the US and Europe (110,000 United miles), this is an absolutely unbeatable deal. 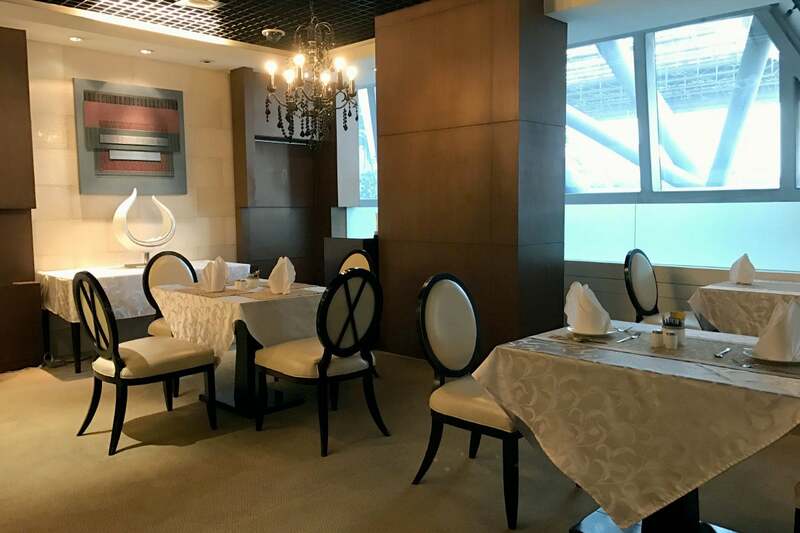 Availability is generally good, too, and you can tack on connecting flights to/from New Zealand and/or other destinations in Southeast Asia for no additional miles as well — if you’re booking a round-trip fare, you can even take advantage of United’s Excursionist Perk and add a stopover. 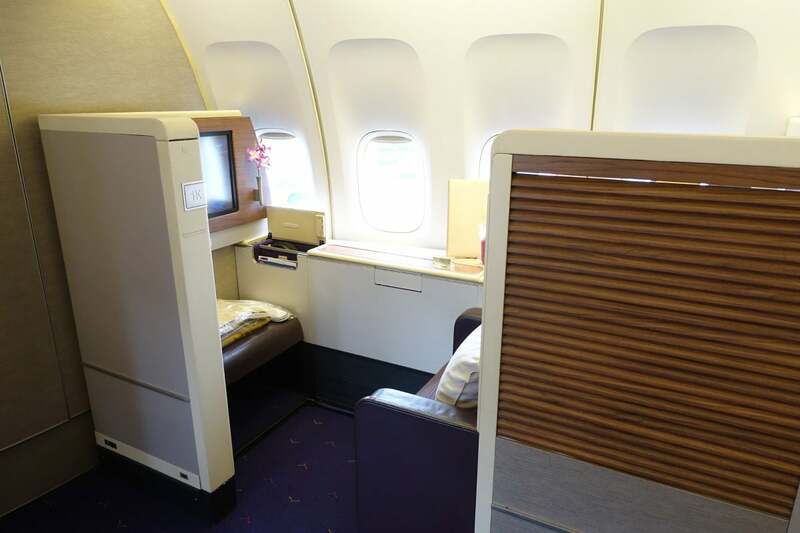 Technically, there are two Star Alliance carriers that sell first class fares between these regions — Singapore Airlines and Thai Airways — but Singapore doesn’t release first-class award space to partners, so unless the airline becomes more generous with availability in the future, Thai’s 747-400 flight between Sydney and Bangkok is really your only option here. 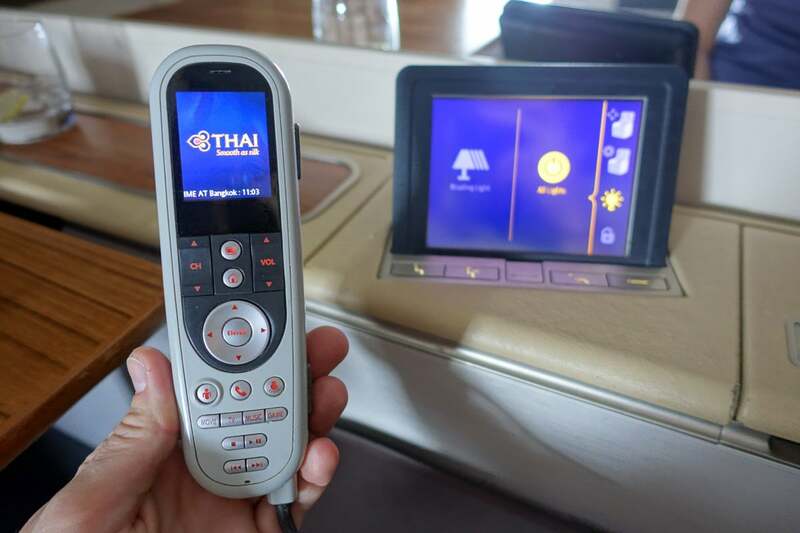 But I didn’t mind — I was eager to try Thai’s “new” 747 first class after experiencing a similar product on the A380 last year. 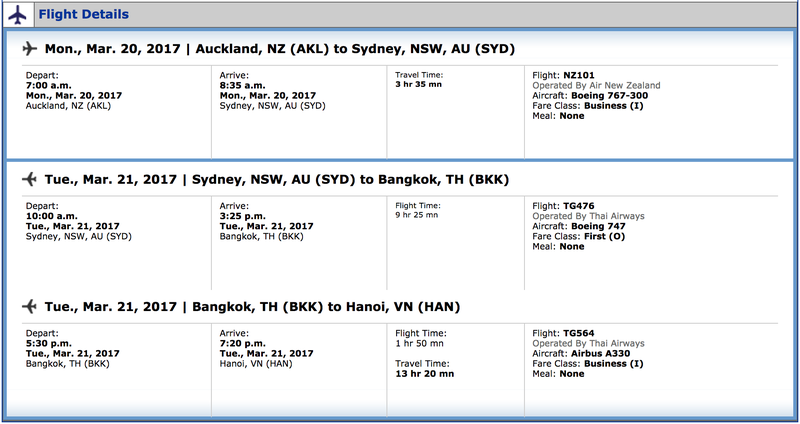 I could have booked only the one-way flight (pictured above), but I instead decided to add on a flight from Auckland to Sydney and one from Bangkok to Hanoi, both in business class, for the same award rate (plus about $50 more in taxes). Advanced points-hobbyists may notice that the itinerary below technically violates United’s award routing rules, given that there’s a stop of more than 23 hours and 59 minutes in Sydney. 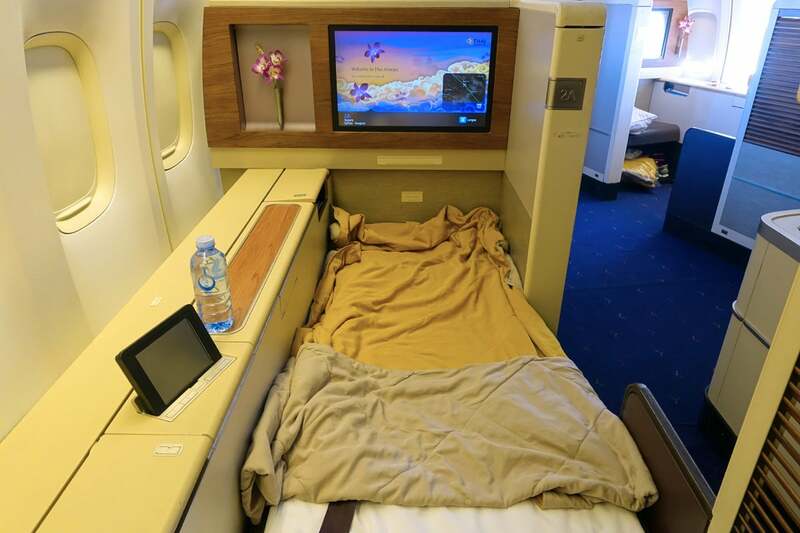 However, a supervisor made an exception and added this leg at no additional cost, since there wasn’t any other business-class award availability that day. 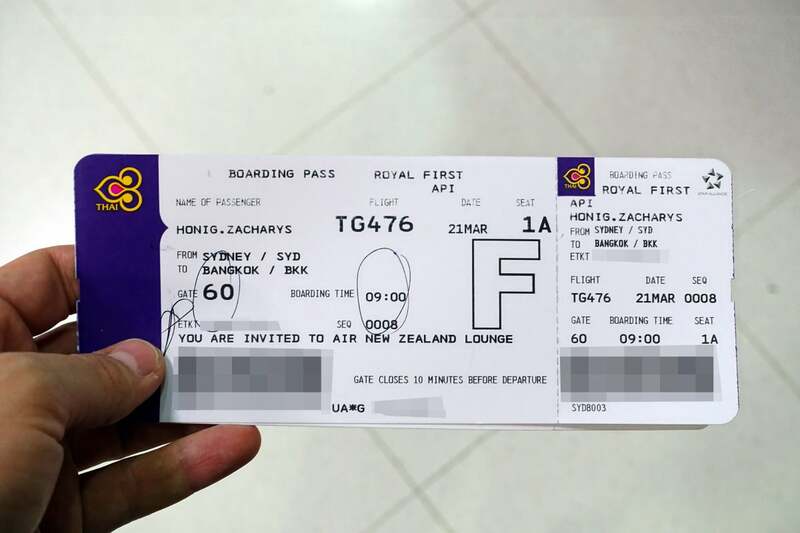 Had I paid cash, the one-way flight would have run me about $3,550 AUD (about $2,715 at the time). Factoring in the award taxes and fees of $66 (for just the Sydney-Bangkok leg), I managed to get a whopping 6.62 cents in value per mile redeemed, which is far above our MileagePlus valuation of 1.5 cents. While this flight is clearly an incredible deal at 40,000 United miles, it’s quite possible that you don’t have that many miles sitting around. Fortunately, you can transfer points instantly from Chase Ultimate Rewards to United at a 1:1 ratio — simply find the flights you’d like to book, then head over to Chase to move your points over. They should appear in your United account right away (or, you may need to log out and log back in before they pop up). 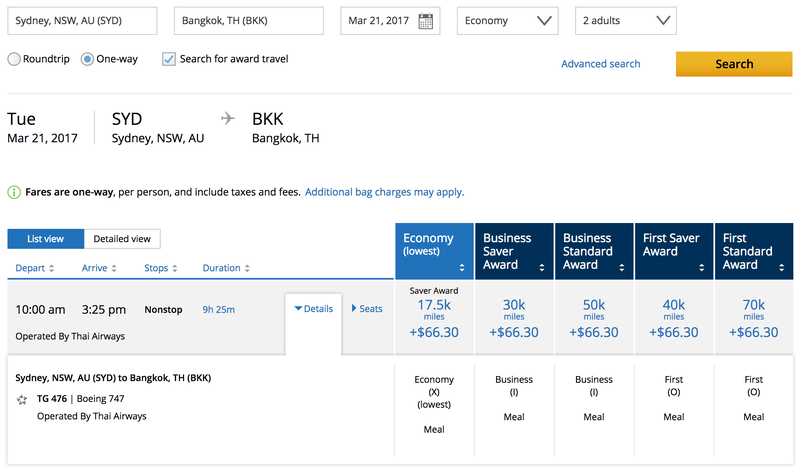 Considering the Chase Sapphire Preferred card is currently offering 50,000 points after you spend $4,000 in the first three months, it’s possible to book nine hours in Thai first class using the points you earn from a single credit card sign-up bonus (with thousands of points left over). That’s pretty nuts! A couple days before departure, I noticed that seven of the nine first-class seats were still listed for sale. 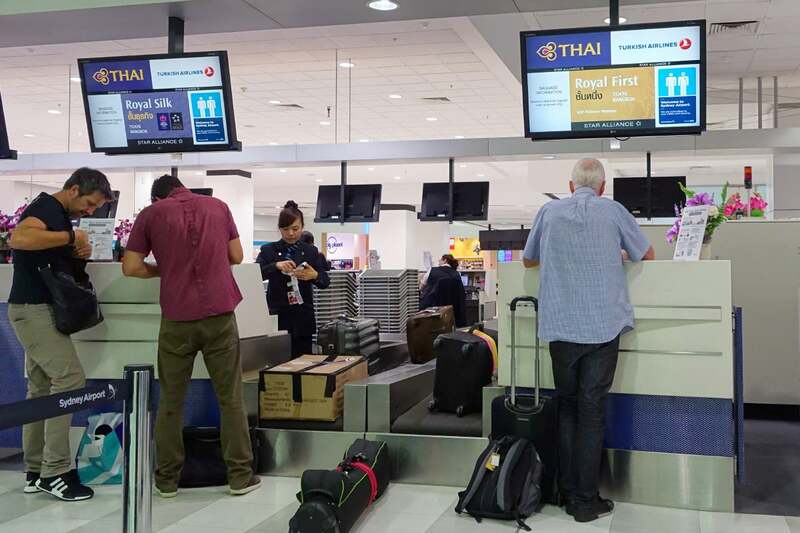 That was still the case just before we left the hotel, but I was a tiny bit nervous that someone had booked at the last minute when I saw the passenger below checking in at the Royal First counter. 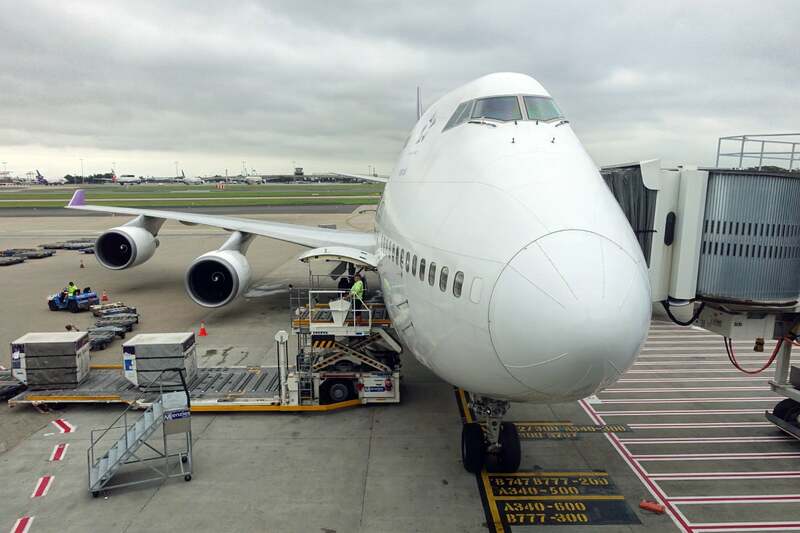 Fortunately, he ended up being a business-class passenger, and the check-in agent confirmed that we’d be alone in the nose of the 747. Score! The agent reviewed our Vietnam e-visas and issued our boarding passes all the way through to Hanoi. 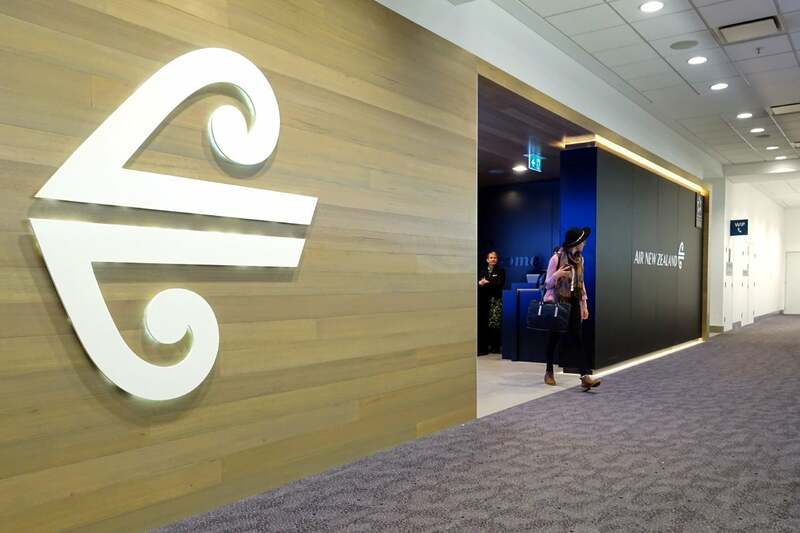 We were directed to the Air New Zealand lounge, which was actually quite a hike from the check-in counter. 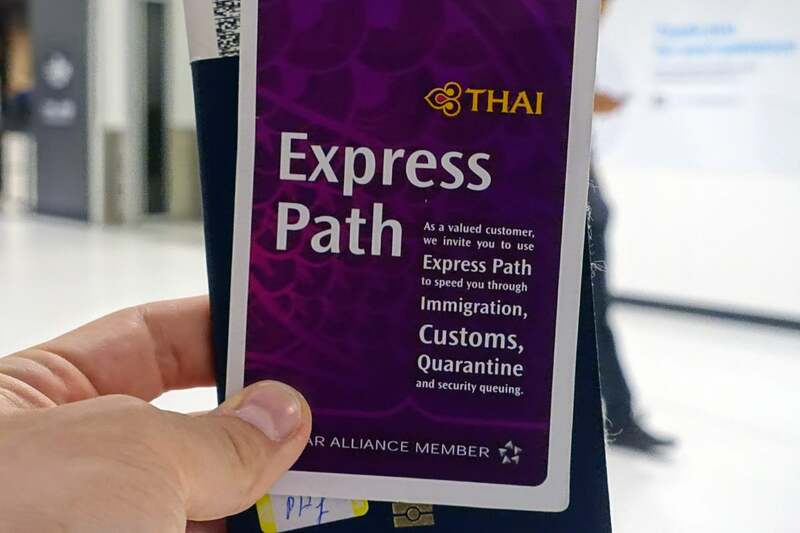 We were also issued “Express Path” passes, which gave us access to an expedited security lane. The regular line wasn’t terribly long, so I’d estimate that we saved five minutes by using the passes. 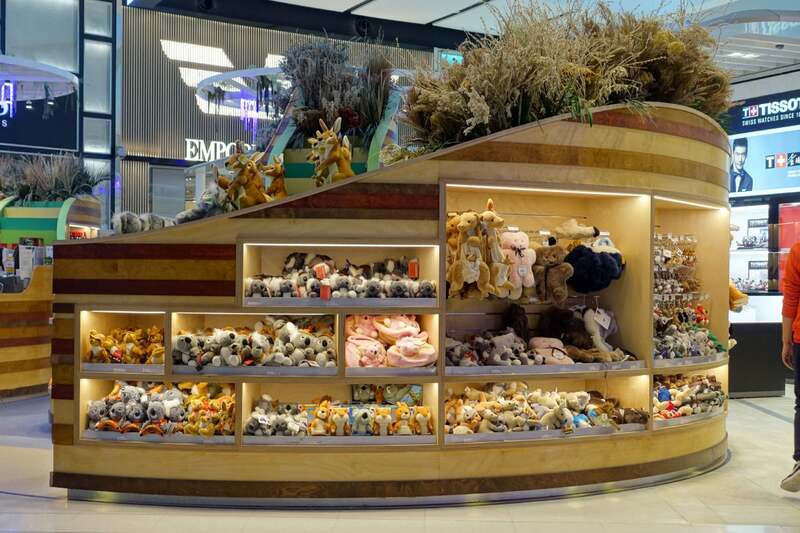 There’s a huge duty free store just after security and immigration, so you have a few more chances to pick up some Aussie souvenirs (although by now, you’ll surely have found a larger selection of kangaroo plush toys and other gifts in Sydney). 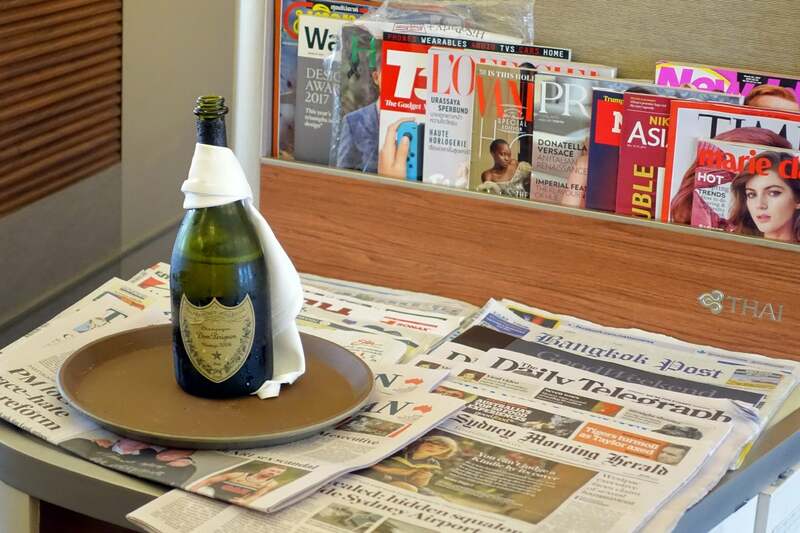 I was pretty excited to see Dom Perignon on sale, considering that’s what Thai serves on board. 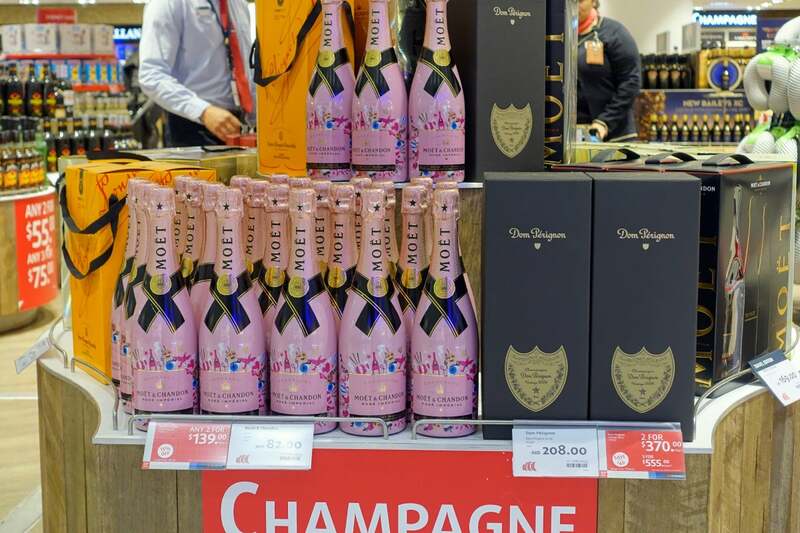 With the current exchange rate, bottles were going for $159 a pop, which was a bit below retail. 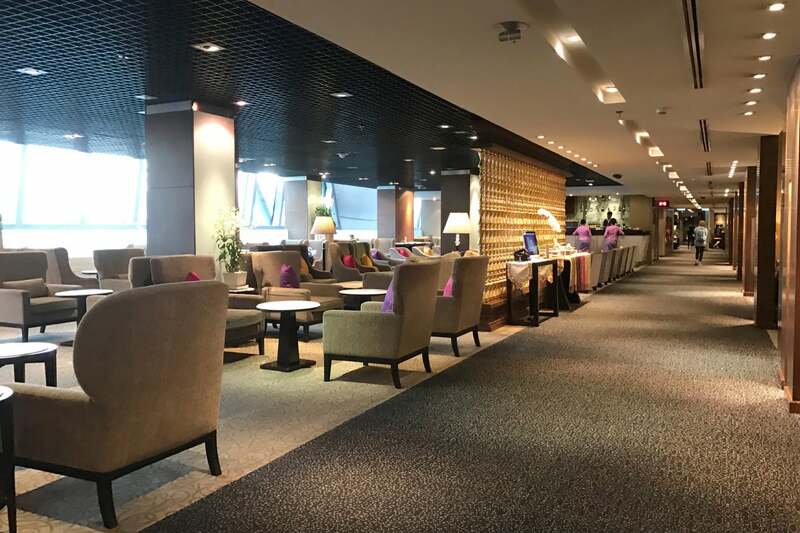 There’s also an American Express Lounge located just past the duty free store, which I was planning to visit until I realized that we didn’t have much time left before boarding and I still had to check out the Air New Zealand lounge. I would have been able to get in using my Amex Platinum Card, but I guess I’ll have to give it a try on another visit. 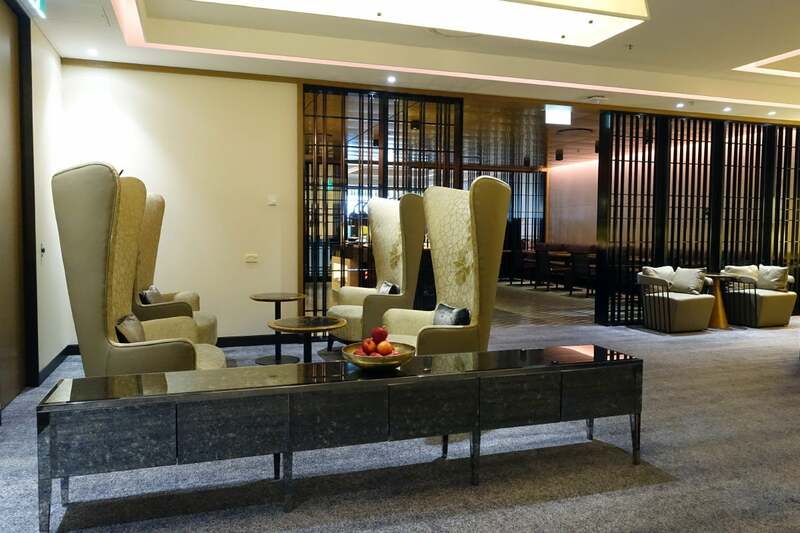 As I mentioned earlier, the check-in agent made a point of telling us that we could access the Air New Zealand lounge. As you’ll see below, there’s certainly a much better pick — perhaps the ANZ suggestion came as a cost-saving measure. 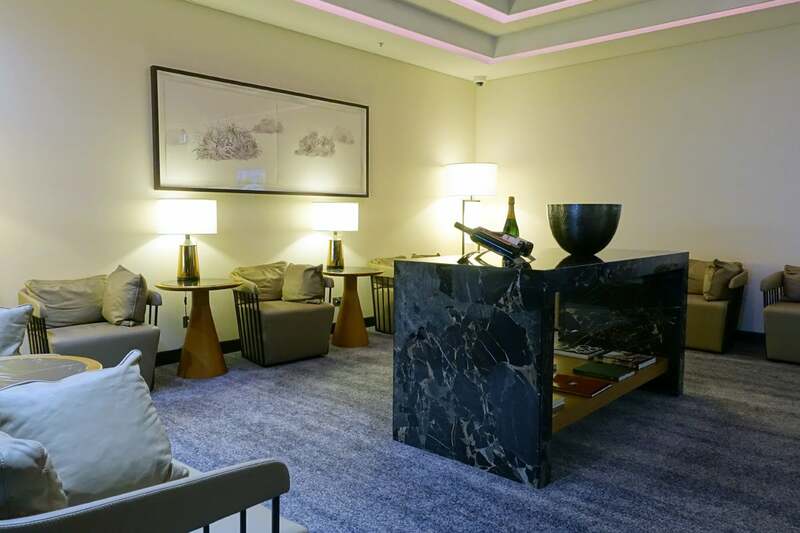 The ANZ lounge was recently renovated — it was quite large with lots of seating, which makes sense given the number of flights between Sydney and New Zealand (several of which are on wide-bodies), and that other Star Alliance customers have access as well. There were a bunch of different hangout spots, including some with tarmac views. 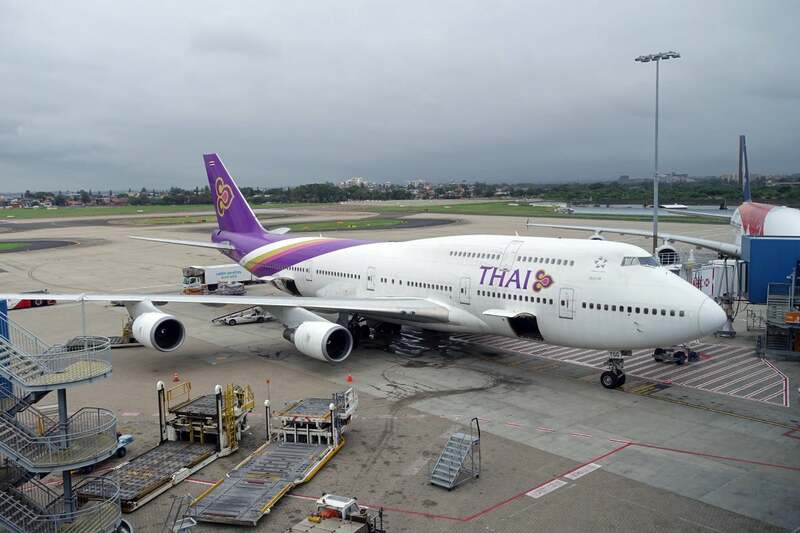 That’s where I caught the first glimpse of our Thai 747-400 — boy am I going to miss this plane! 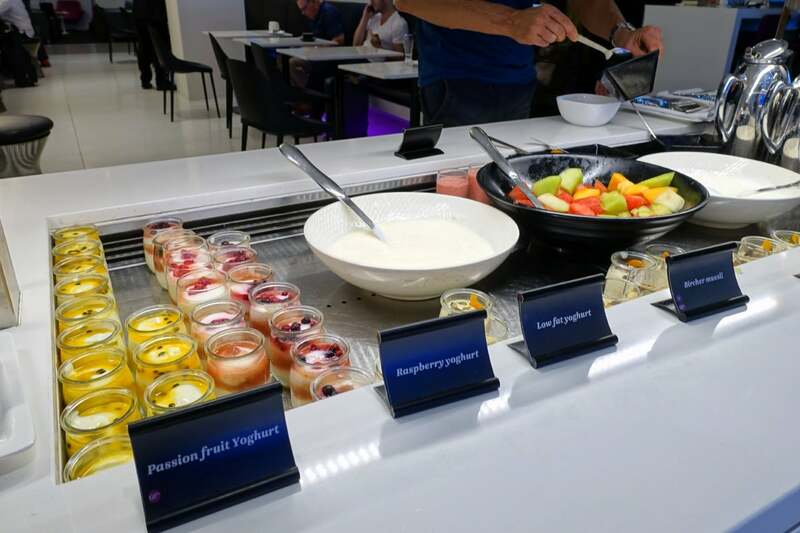 If you’re more interested in food than tarmac views (or perhaps you’re after a bit of both), there are several cold and warm breakfast options on hand. 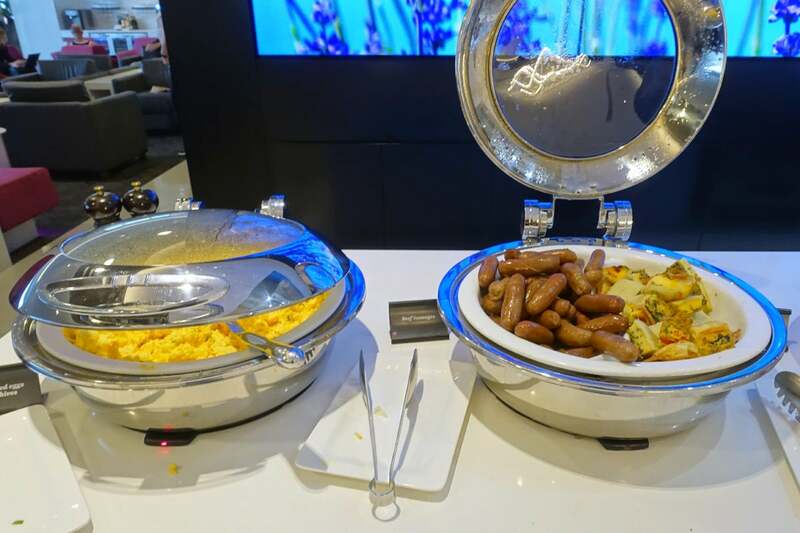 The food looked pretty decent for an airport lounge spread. Nothing to write home about by international lounge standards, but still not bad. 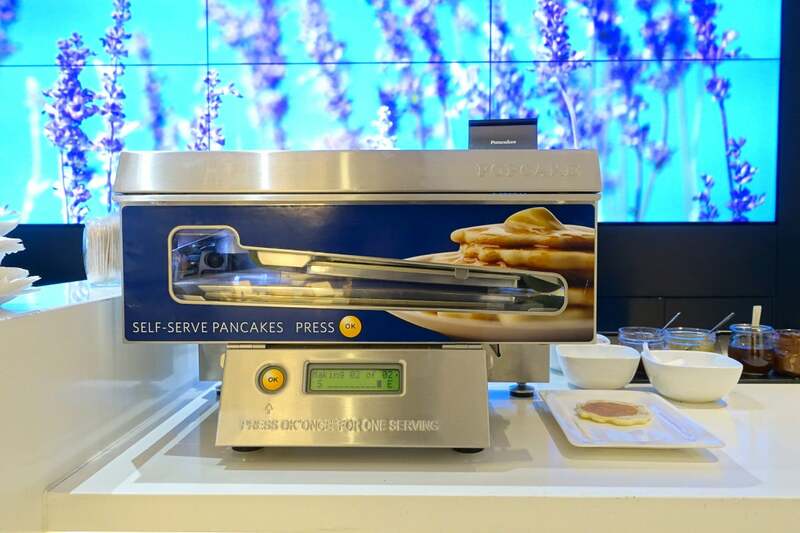 Also… there was a self-serve pancake machine! I seemed to be the only person interested in trying it out — press that yellow button below, a bit of batter drops out onto a moving conveyor belt and a fresh pancake pops out a minute or so later. To be honest, I wasn’t terribly impressed with the finished product, but the machine certainly provided a few minutes of entertainment. After a quick snack, I decided to check my email and test out the Wi-Fi. 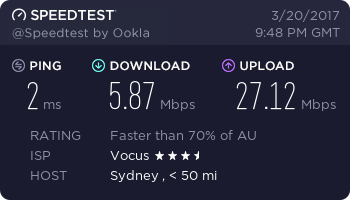 Speeds were decent, as you can see below. 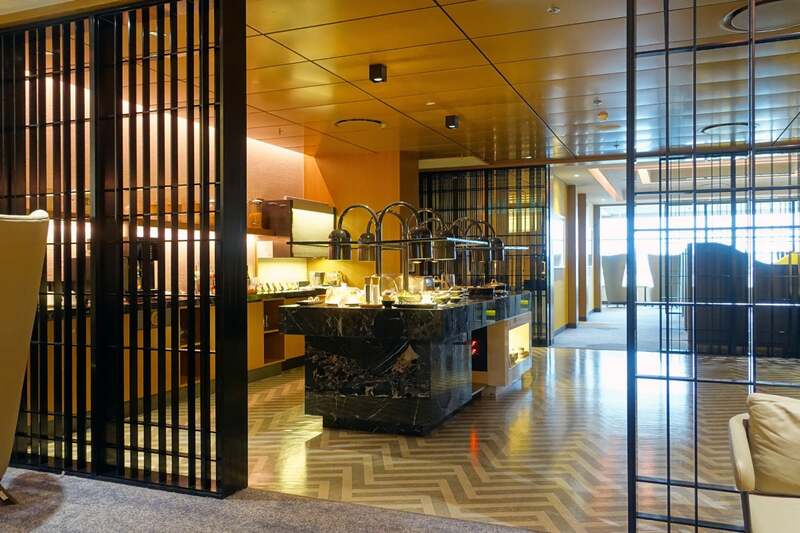 As I mentioned, Singapore Airlines also offers first class on flights from Sydney, and it should have occurred to me that there would be a first-class lounge as well. I didn’t see that referenced on any of the signage, though, so we had walked right on by to the ANZ lounge, instead. 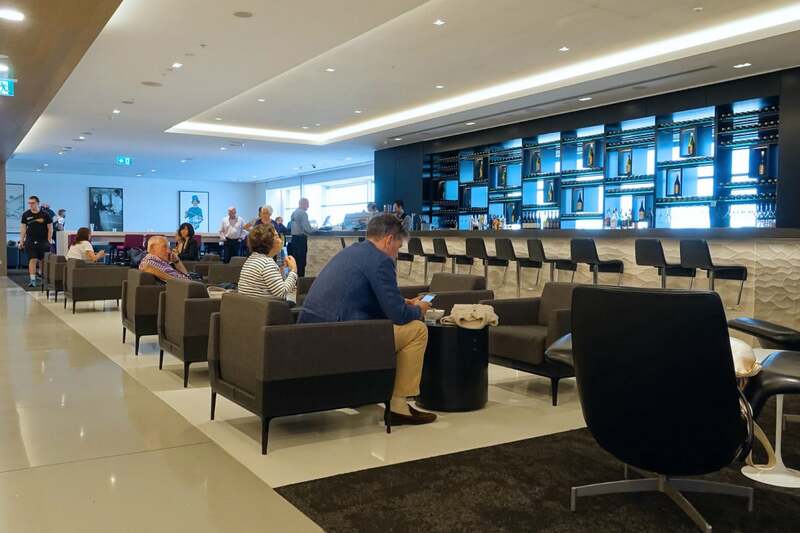 Well, as it turns out… not only is there a dedicated lounge for first-class passengers (including those traveling on partner flights), but it was recently renovated, so it’s in great shape. And the lounge was completely empty for the duration of our stay, so we had it all to ourselves. 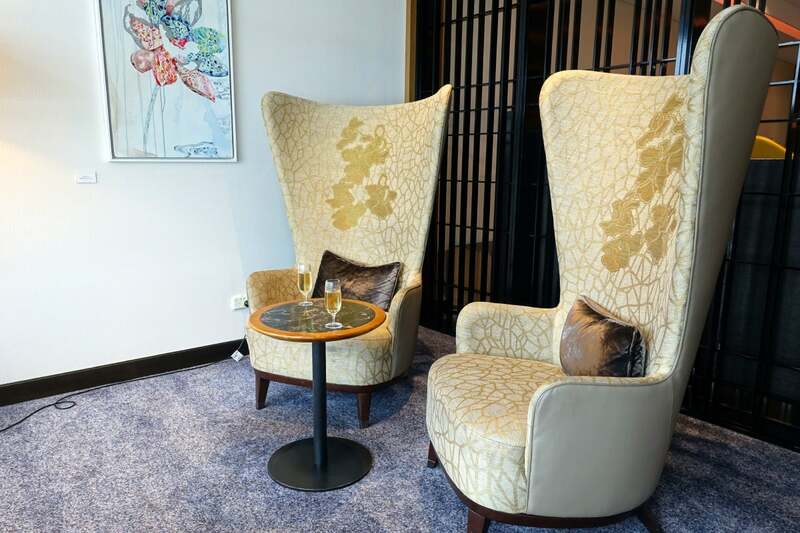 You’ll enter a large room after you walk in through a hidden door behind the main check-in counter, with the high-back seats above and the additional seating seen below. There are books to read, along with a small selection of newspapers and magazines. 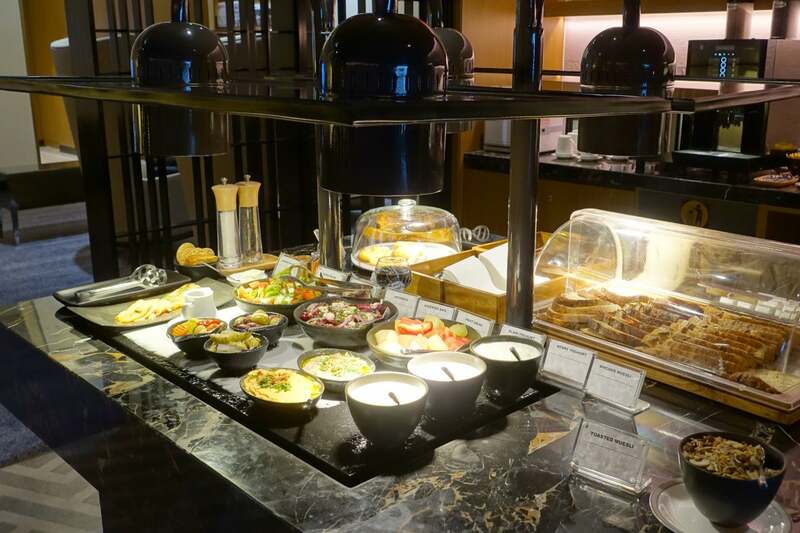 In the next room, you’ll find a small (but very high-quality) buffet area. There were several breakfast and light lunch items available, which makes sense given that it was around 9:15am at this point. 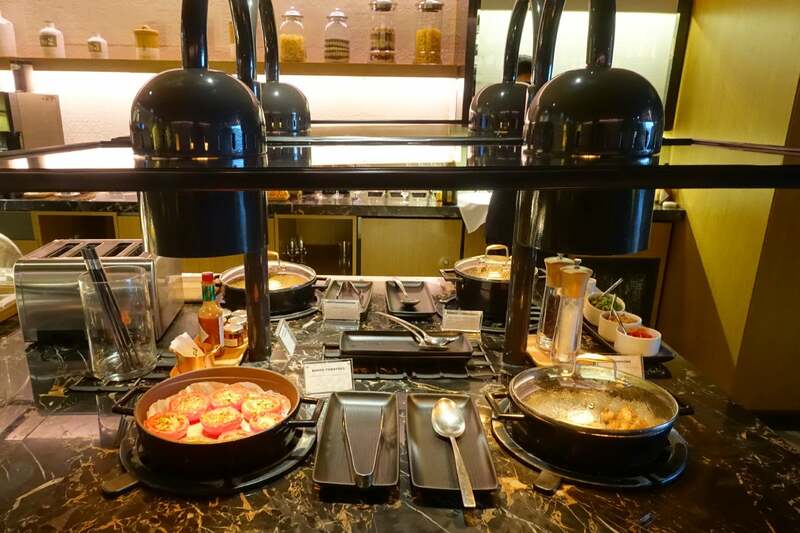 You can choose items from the buffet or order something else from the staff (I requested an omelette, which you’ll see below). 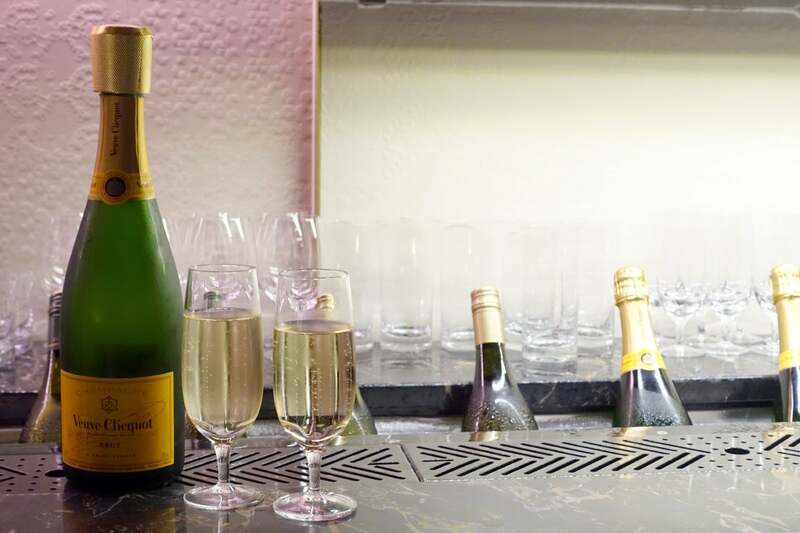 The lounge serves one of my favorite Champagnes, Veuve Clicquot (about $55 a bottle). There’s also a selection of red and white wine, along with beer, cocktails, soft drinks and juices. 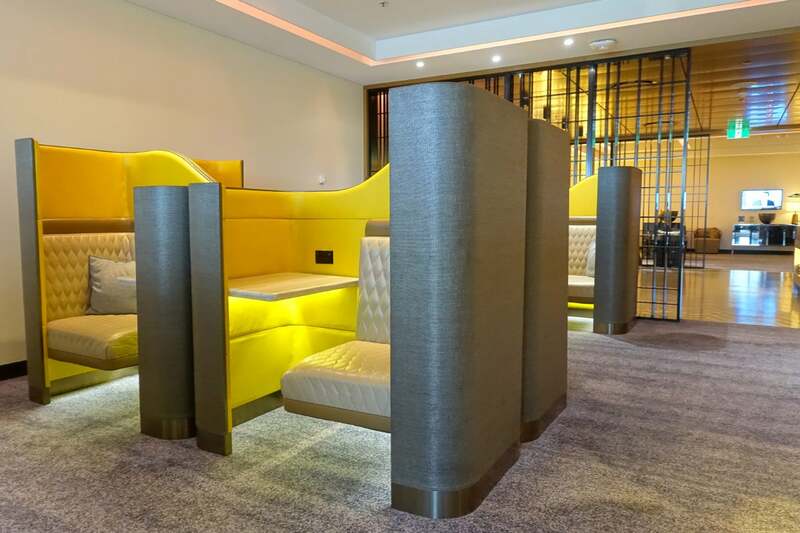 The next room has several cubicle-style seating areas — these remind me a bit of the seats in United’s first Polaris Lounge. Then, in the last room, you’ll have a view of the tarmac below. 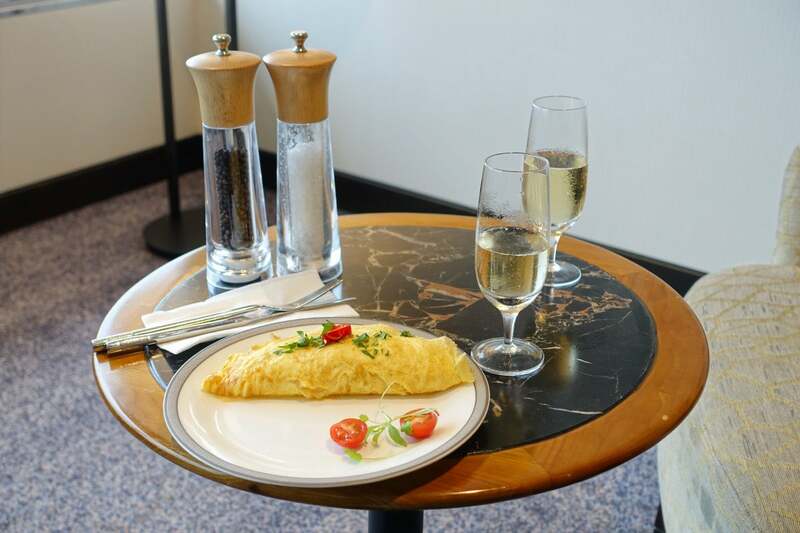 And here’s that omelette I had requested — it was perfect. Just for kicks (and the purposes of this review), I fired up my laptop and ran a test here, too. 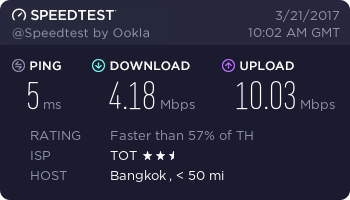 The Wi-Fi wasn’t especially speedy, but I had no trouble loading articles and checking my email. 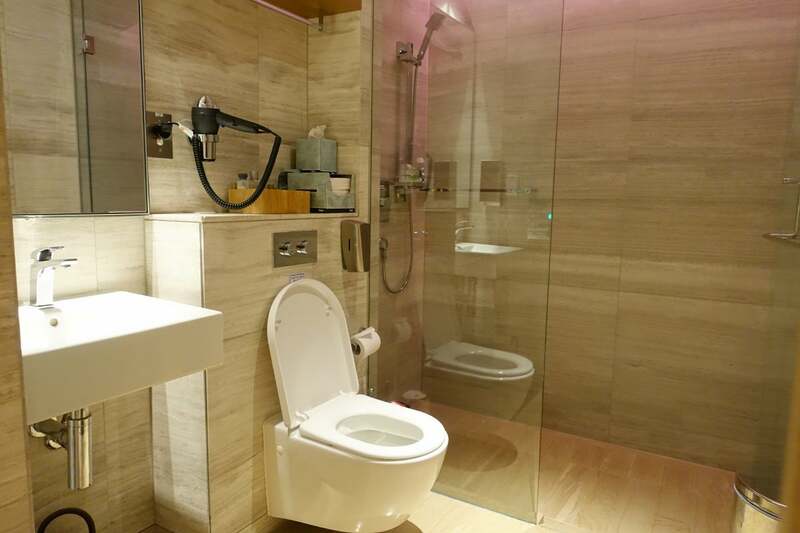 The first-class lounge also has some pretty posh restroom facilities. There was cologne on hand, along with shaving cream, a comb and some toothbrush sets. 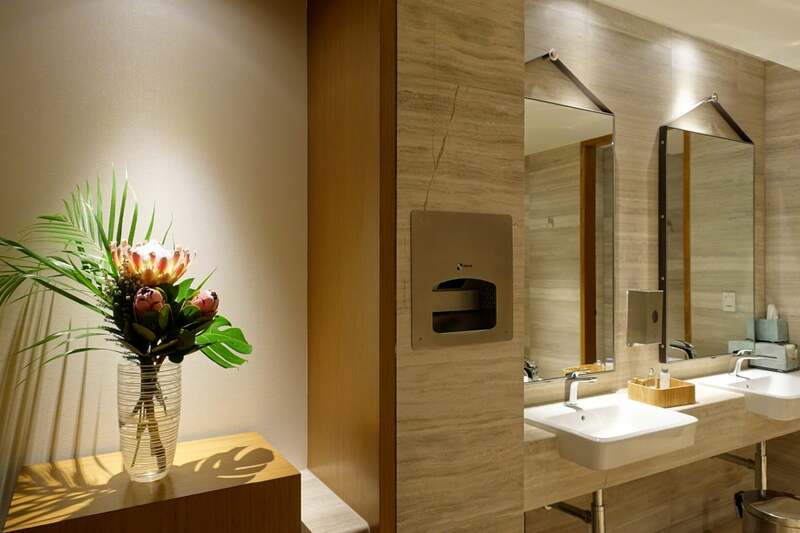 The shower rooms were nice as well, but nothing like what you’d find in, say, Lufthansa’s First Class Terminal. After 20 minutes in the lounge, it was time to head to the gate. According to our boarding passes, the flight was due to board a full hour before departure. That didn’t happen, of course — it was a bit after 9:30am before the first passengers arrived on board, but we still managed to push back more or less on time. 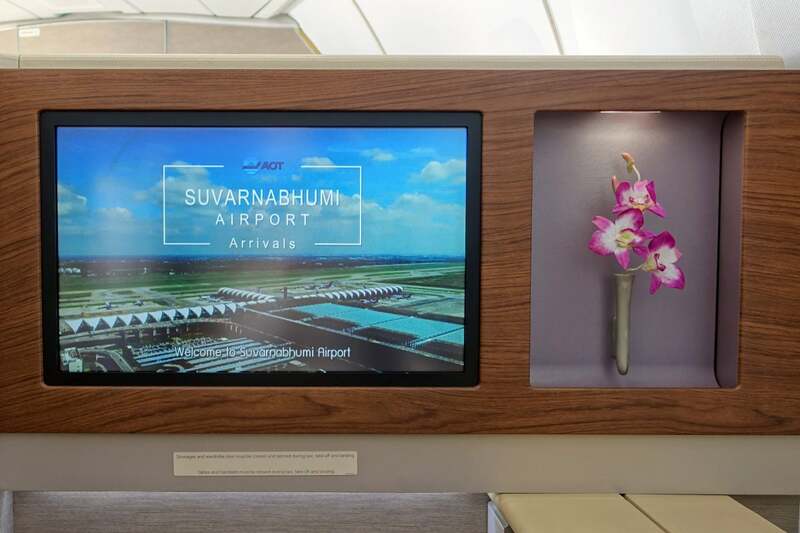 There were two jet bridges available — business-class passengers seemed to head down the first, which brought them directly into our first-class cabin (ahem). As I mentioned, we had selected seats 1A and 1K. But it didn’t really matter — even though the seat map showed that four other seats were occupied, we really were the only first-class passengers on board, so we ended up using 1A and 1K as our “entertainment rooms,” 2A and 2K as our “bedrooms” and 3E and 3F as the “dining room.” With no other passengers to speak of, we had even more private space than you’d find in Etihad’s A380 Residence, but with a much more manageable price tag (but no showers). 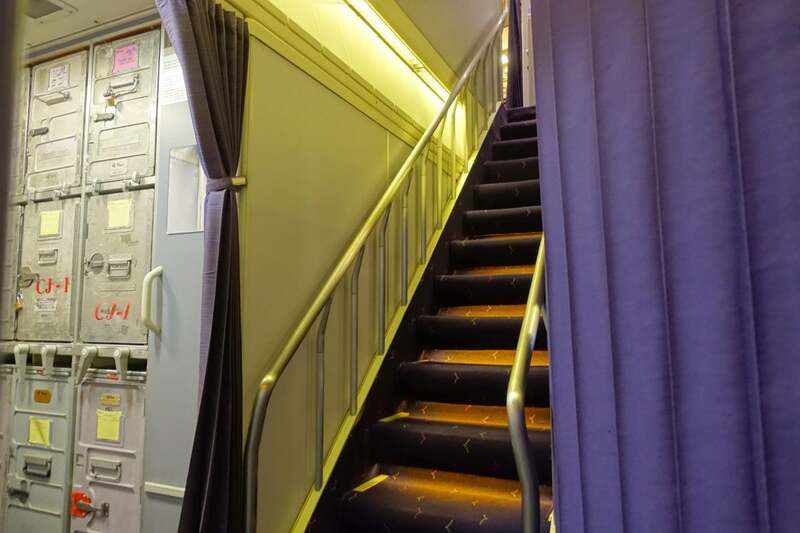 First class is in the nose of the 747 — at one point, I joked that we had more room to stretch out than the President of the United States, who also sleeps in the nose of a 747. I snapped a few more pictures as the boarding process continued. 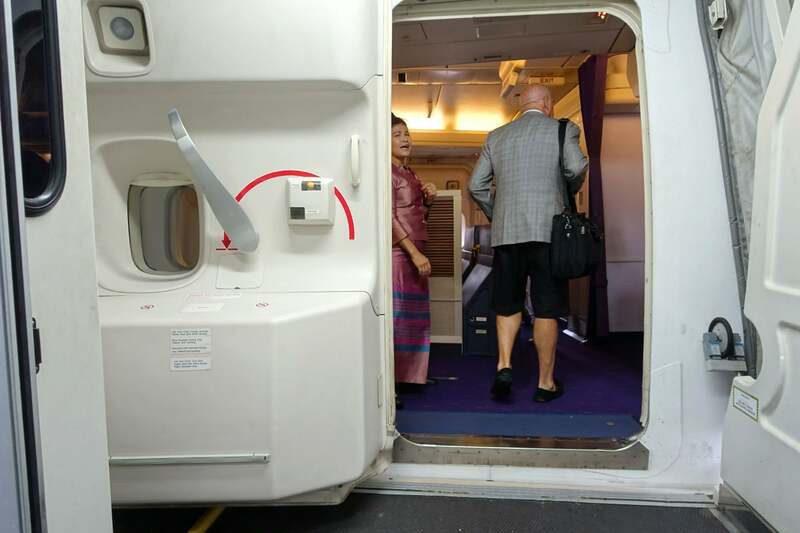 You might be able to spot the purple curtain hanging near Door 1 — flight attendants closed that after takeoff, sealing us off from business-class traffic and the rest of the plane. (Important detail alert!) 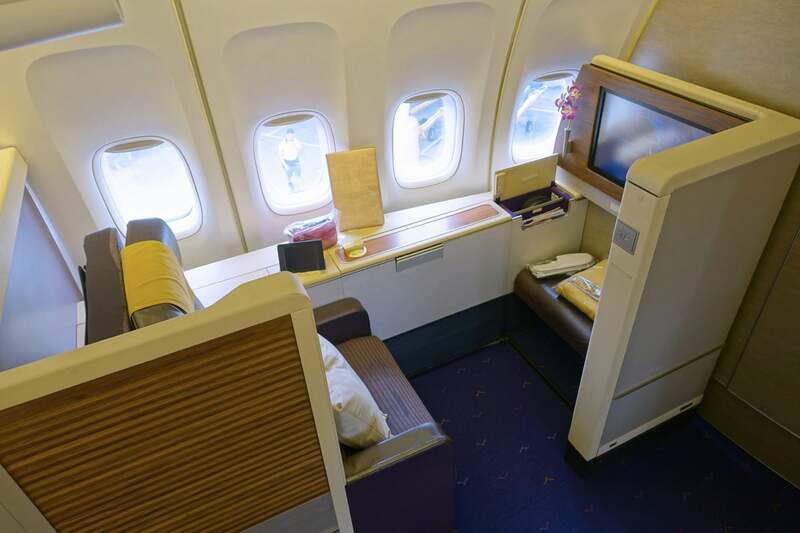 Thai operates two configurations of the 747-400 — one has this “new” first-class product (described by the airline as a “semi-private suite”) with a total of nine seats, while the other has a much, much older first class product with a total of 10 seats. 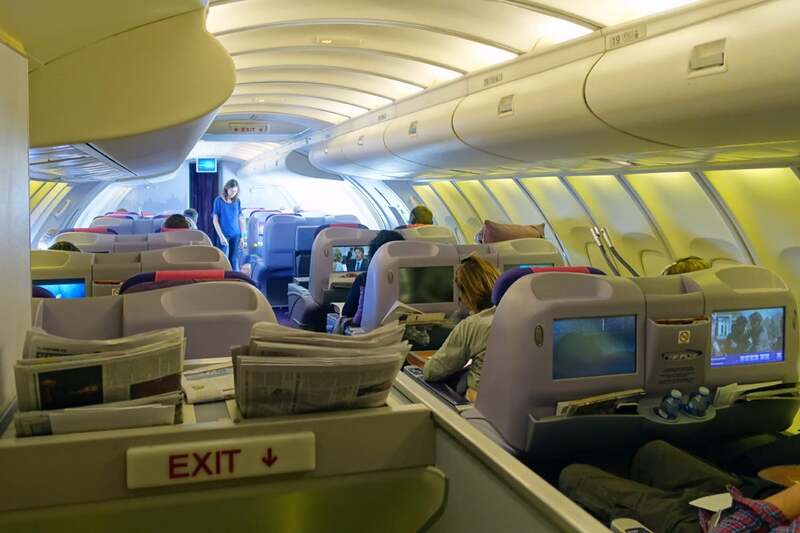 You want the plane with nine seats, and unfortunately both are used on flights to Sydney — and substitutions are possible. 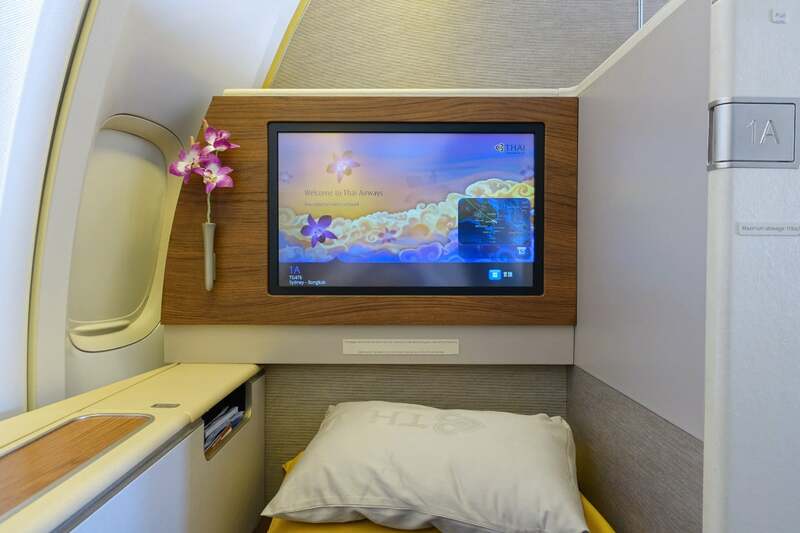 These seats really blow their predecessors out of the water — you’ll have far more privacy, an updated in-flight entertainment system, and other new in-seat features, like some pretty cool accent lighting. 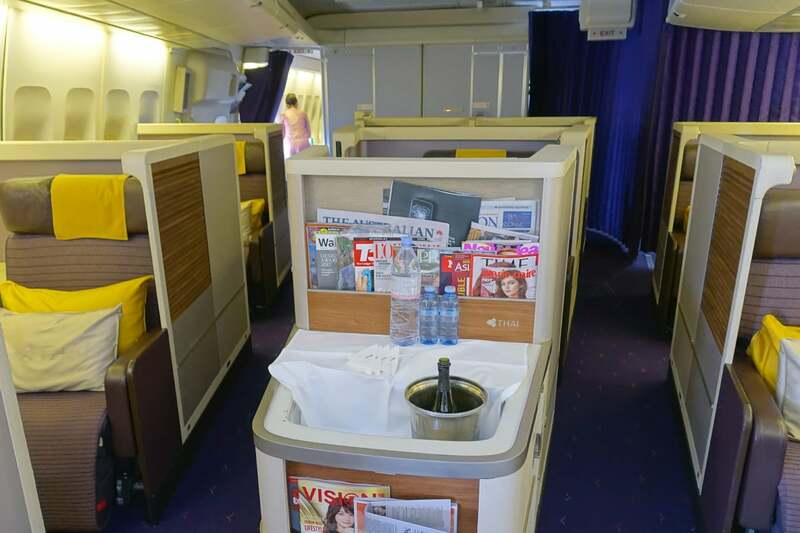 The first-class cabin has two (more or less) identical lavatories. 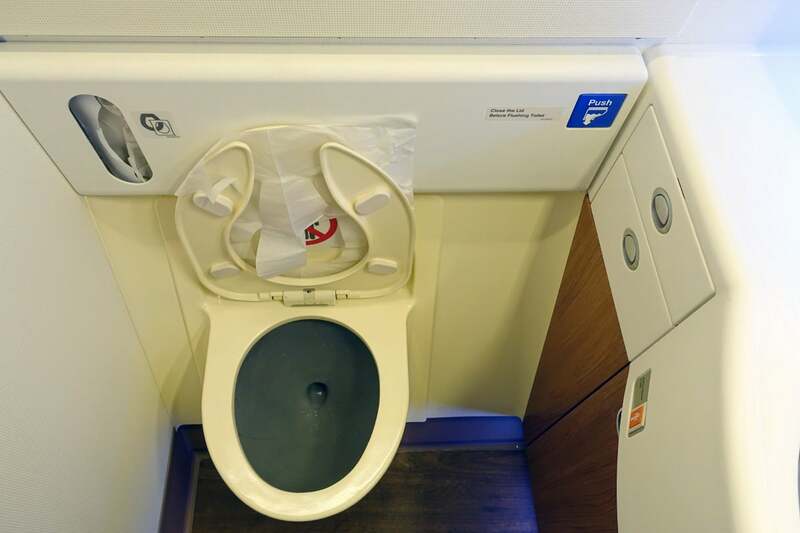 They’re small, but the flight attendants kept them spotless throughout the flight (which, admittedly, shouldn’t have been much of an issue with just two passengers). 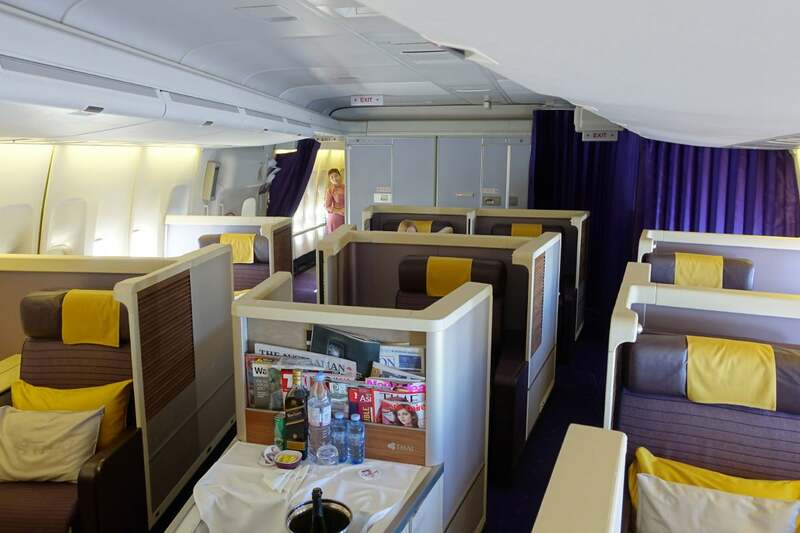 Given how much I love the novelty of an in-flight staircase, I also took a look at the upper deck. 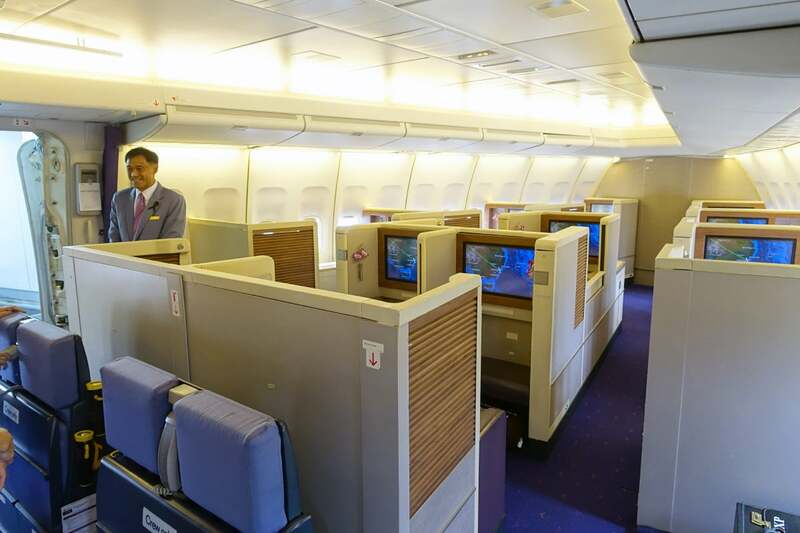 There, you’ll find 26 angle-flat business-class seats arranged in a 2-2 configuration, with 14 more downstairs. 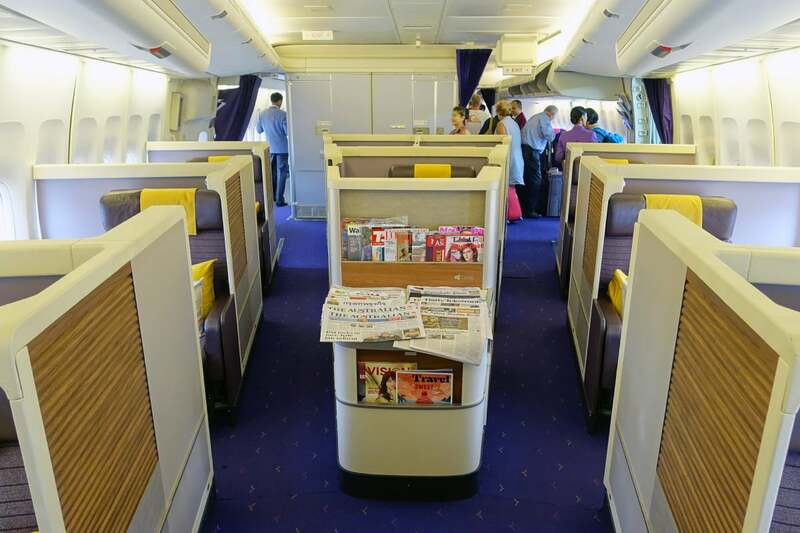 According to Thai, first-class seats on this version of the 747 are 23 inches wide, compared to 27 inches on the A380. 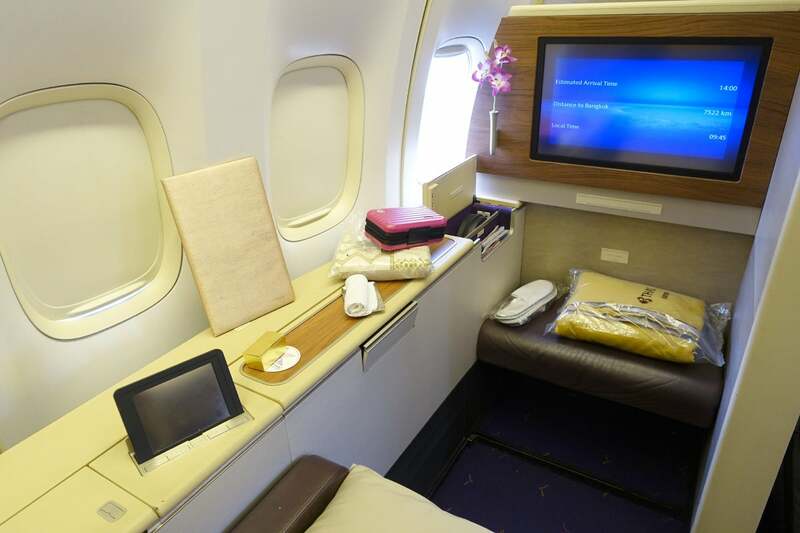 My seat, 1A, is pictured below. I certainly didn’t feel cramped. From the design of the seat, it seems like a sliding door would be a natural addition. Unfortunately, that wasn’t in the cards for Thai, but with no strangers to look at, it wasn’t at all necessary on this particular flight. 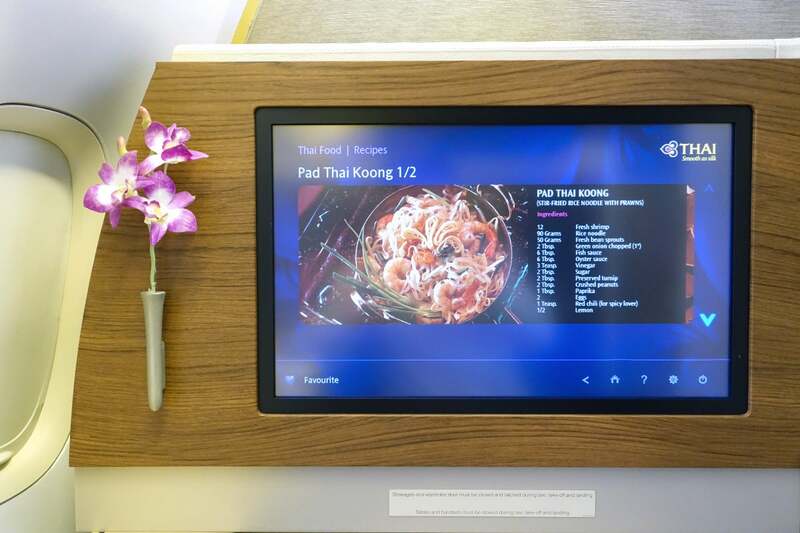 Thai’s latest first-class product offers a 23-inch touchscreen display — it’s not the largest in the industry, but it’s more than adequate. The seat itself was very comfortable, though I was surprised to see some stains on the fabric. 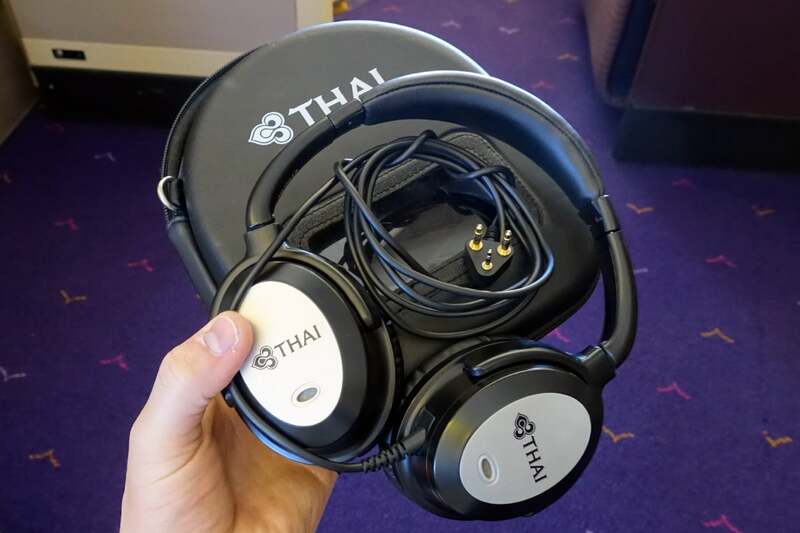 I’ll give Thai the benefit of the doubt and assume these were from the outbound flight to Sydney. 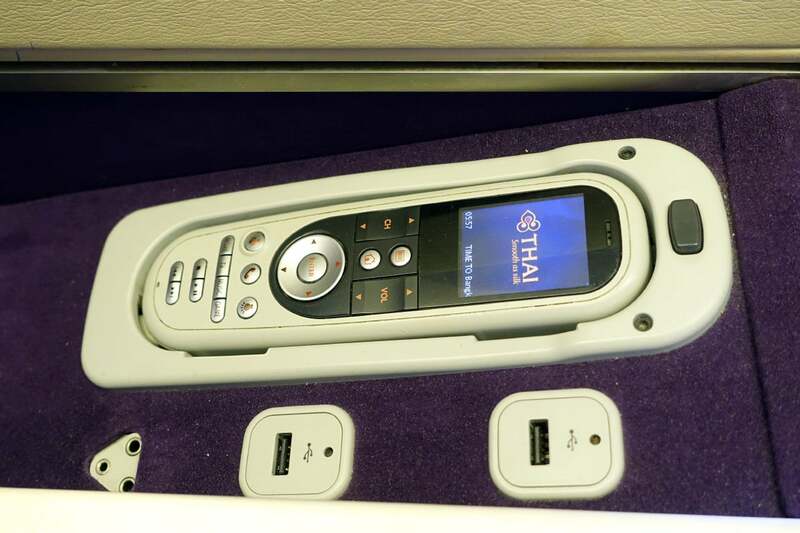 There’s a standard wired IFE remote, a three-prong headphone jack, a universal power outlet (not pictured) and two USB ports. There’s also a touchscreen seat and lighting control. 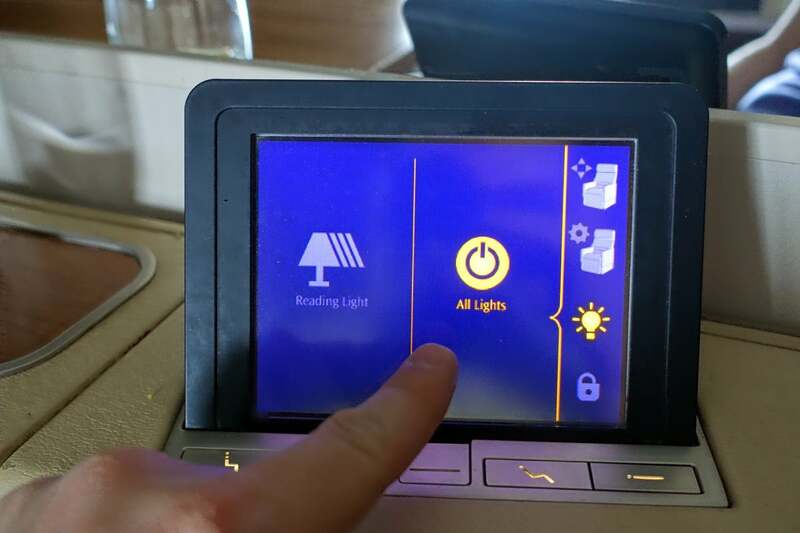 The “All Lights” button above controls the seat’s ambient lights, including one just above the (artificial) orchid below. 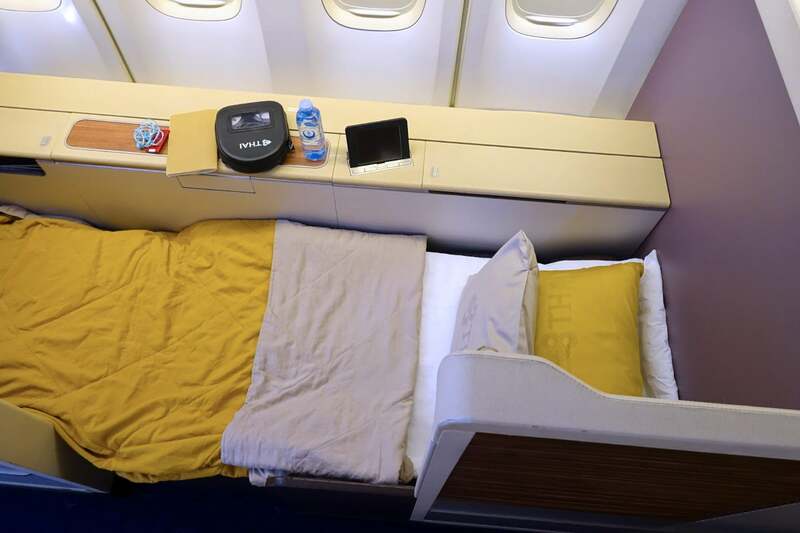 Naturally, the seat converts to a lie-flat bed — first-class passengers get turn-down service as well, including pillows, a comforter and mattress pad. I found the bed to be reasonably well-padded and comfortable overall. 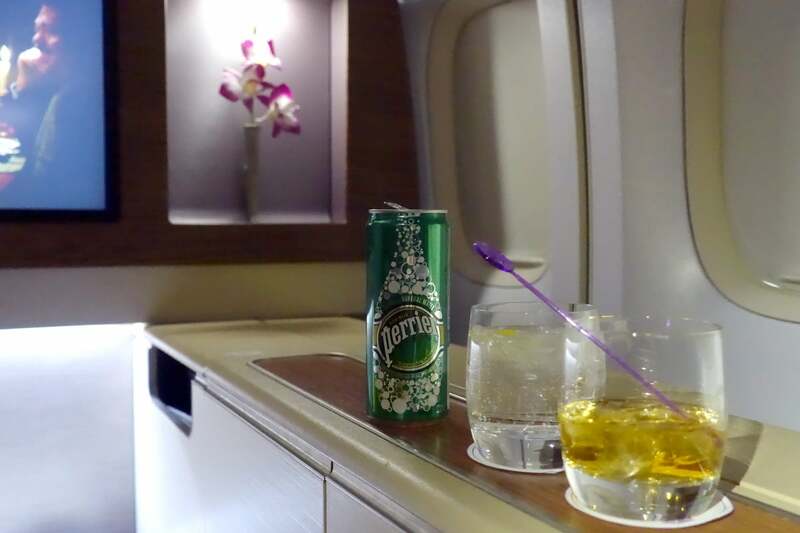 It’s also worth noting that the flight attendants tend to keep the cabin quite warm by default — since there were no other passengers in first class, I simply asked the crew to lower the temperature and it was much cooler within a few minutes. 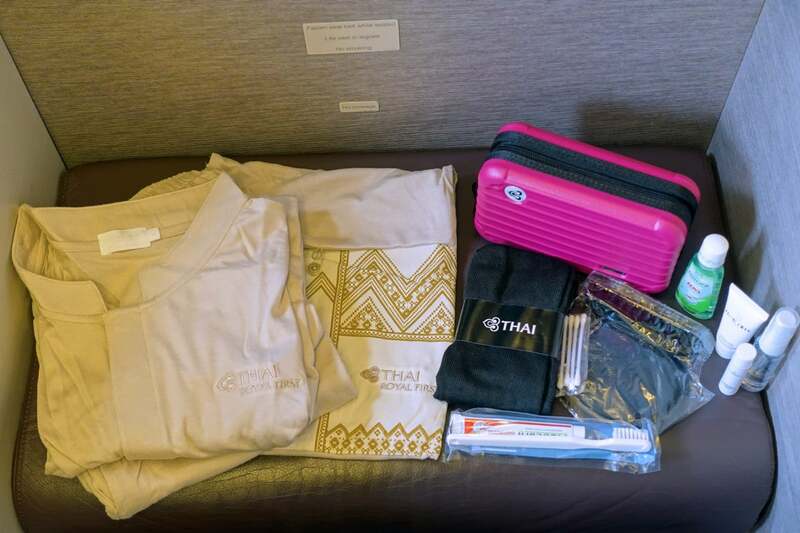 Thai also offers phenomenal pajamas and Rimowa amenity kits on long-haul first-class flights. The kits come in various colors, but we both received hot pink on this flight. 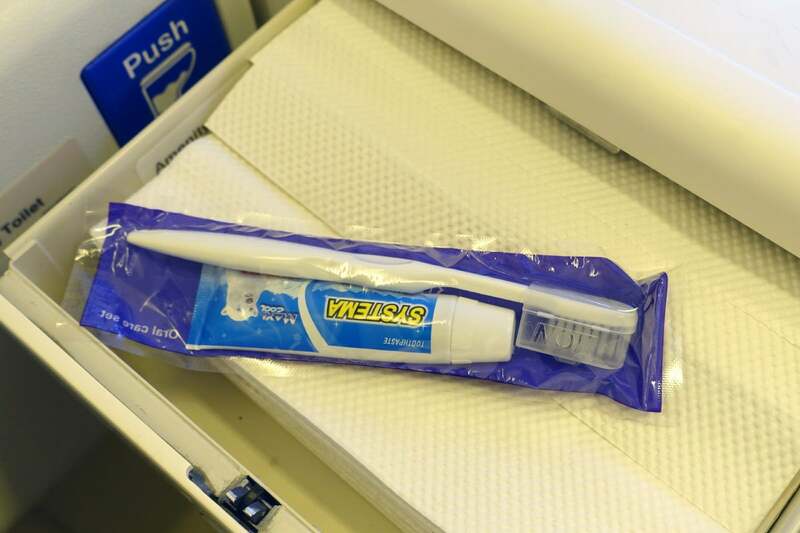 … and additional toothbrush sets (in case you forget yours at your seat, perhaps). There’s also a selection of magazines and newspapers available at boarding and throughout the flight. 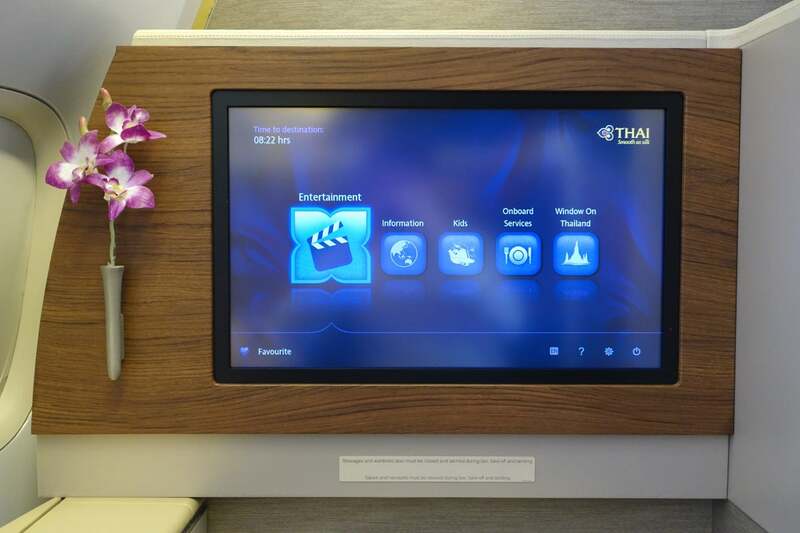 As I mentioned, Thai’s first-class seats (on this version of the 747-400) offer 23-inch displays. 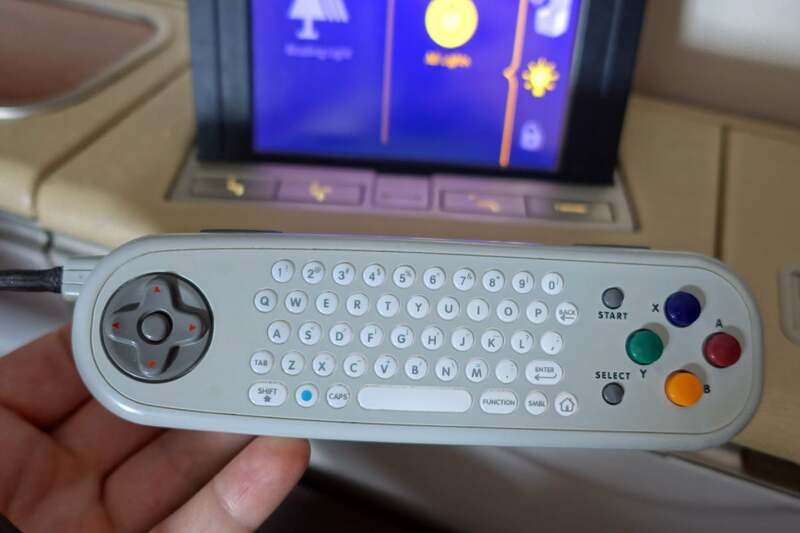 There’s a fairly basic wired remote — if you’ve flown long-haul on a few different airlines, you’re probably familiar with this model. The remote also doubles as a game controller. There are also noise-canceling headphones available — they were decent, but you’ll be better off bringing your own higher-quality pair. 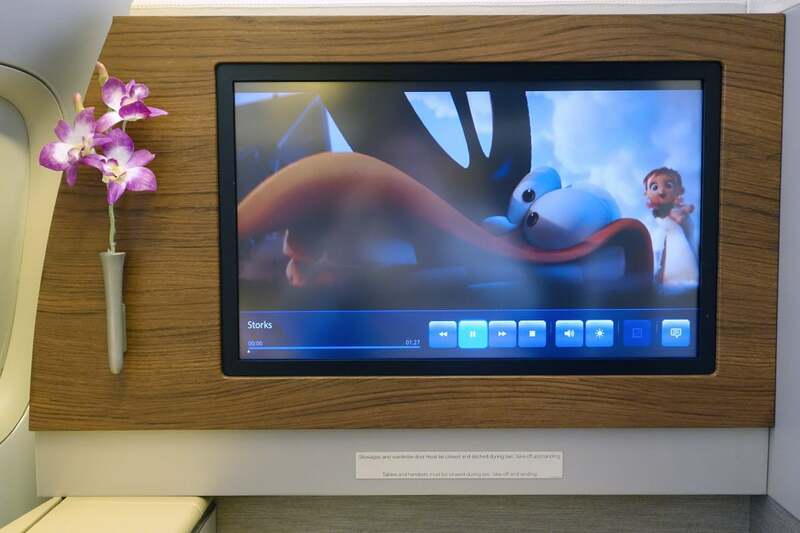 There’s a mix of content available on board, including movies, TV shows, games and a flight map, among other options. Thai’s movie and TV show selection is decent — there were more than 20 new releases, for example. 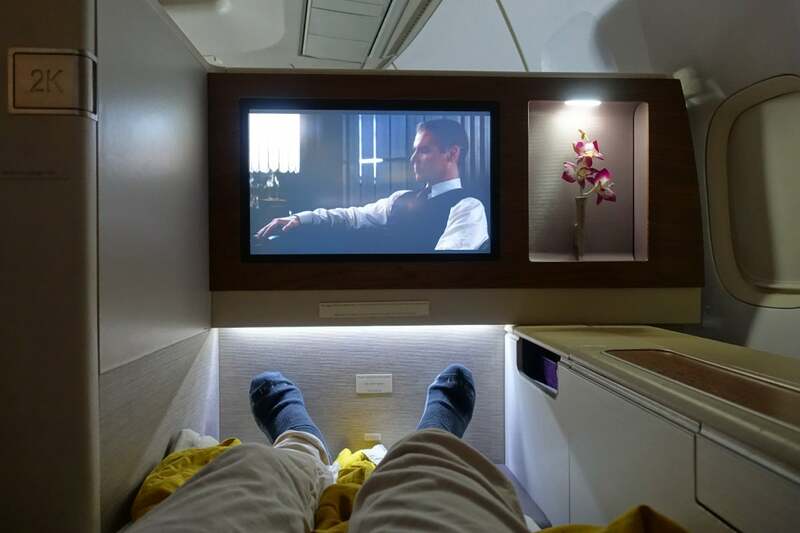 The screen was fairly sharp, with variable brightness levels — I was able to enjoy the content even when the cabin was very bright, though the screen did appear to have a bit too much contrast, so highlight and shadow areas were difficult to make out in some scenes. I should also note that my IFE system froze at this point, and responded with a significant delay for the rest of the flight. Fortunately, I had plenty of other seats to choose from — and I probably could have asked a flight attendant to reset my system — but this could have been pretty frustrating if the cabin had been completely full. 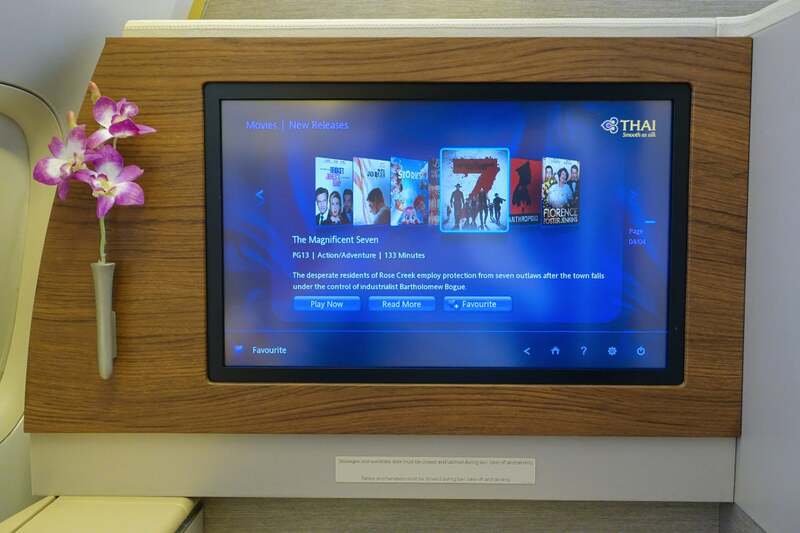 I also did some digging through the “Window on Thailand” section — particularly the Thai Food selection (none of which was available on board, unfortunately). 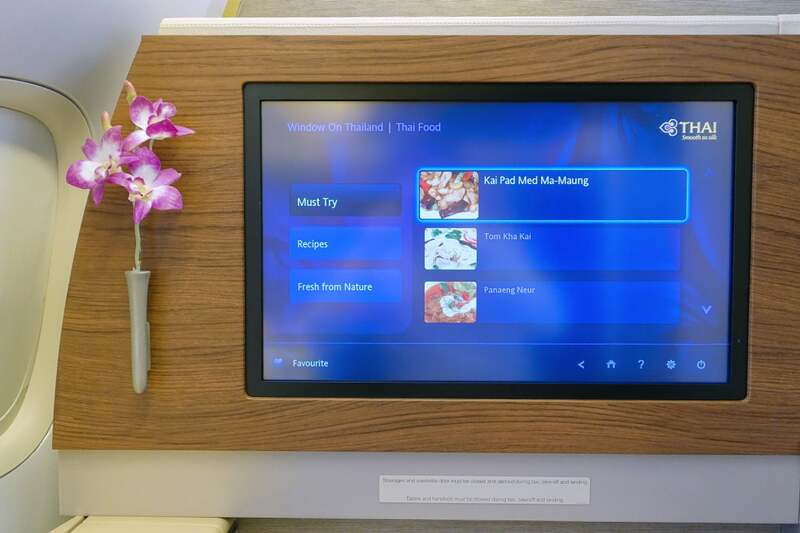 You can even view recipes of popular dishes, though that’s obviously of limited use on an airplane. 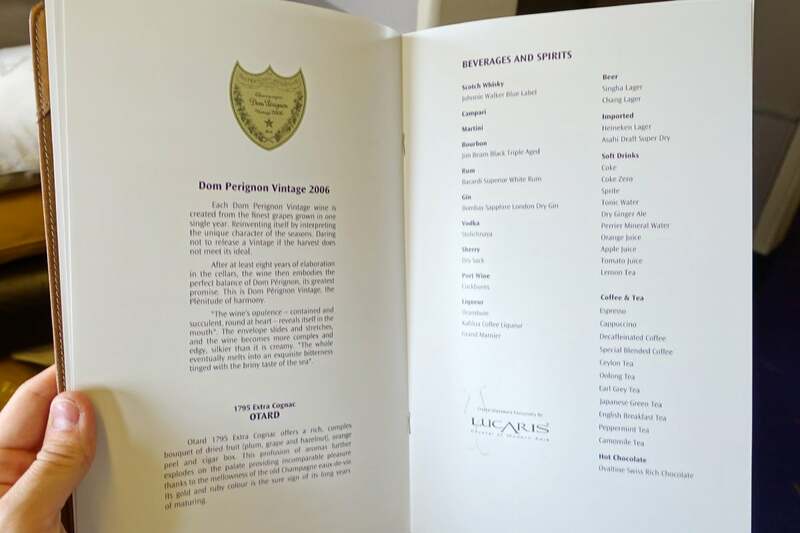 The airline also serves Dom Perignon (2006 vintage, about $180 on the ground), along with high-end spirits like Johnnie Walker Blue (about $180 on the ground). 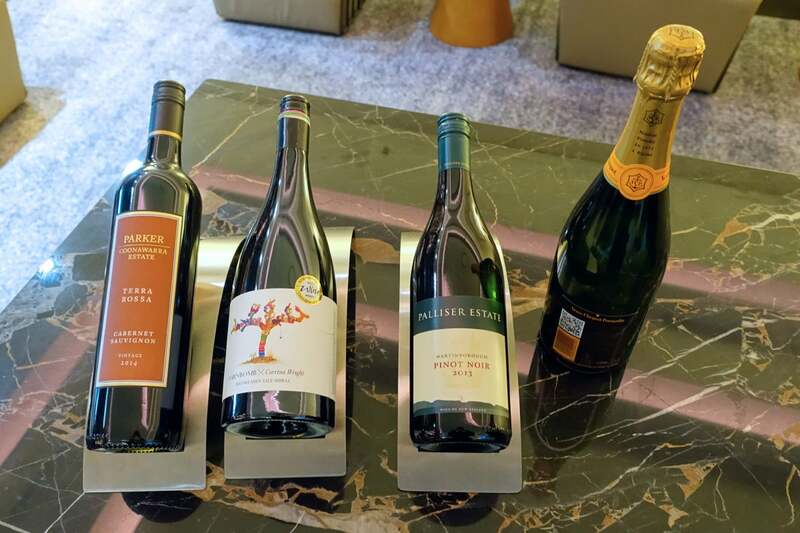 Given that there were only two of us on board, I decided to be a bit conservative when it came to new bottles — each would be opened just for us and not reused. 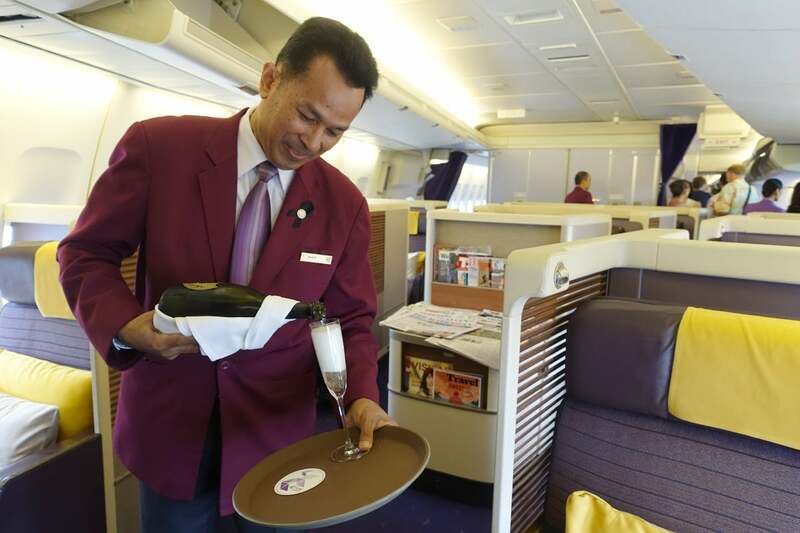 While some airlines will only serve less expensive alcohol on the ground (to avoid paying taxes on the good stuff), Thai doesn’t hesitate to pop the Dom. 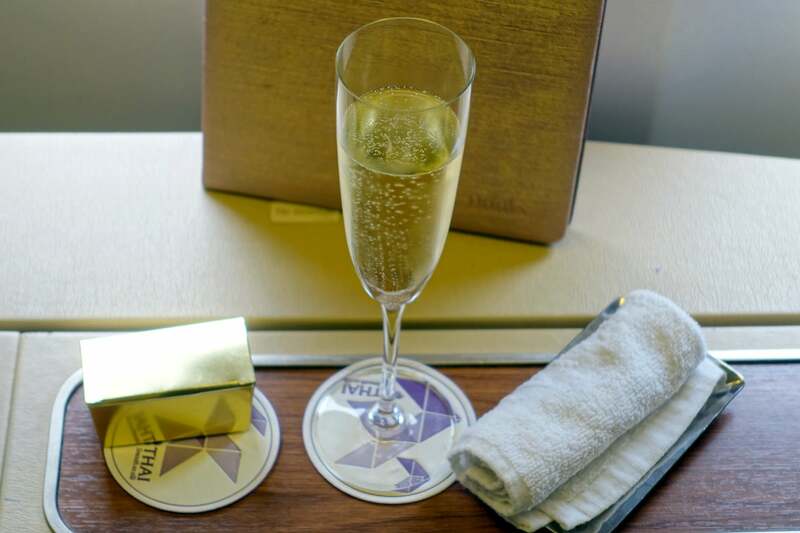 I had a glass of Champagne before departure, which was served with chocolates and a warm towel. 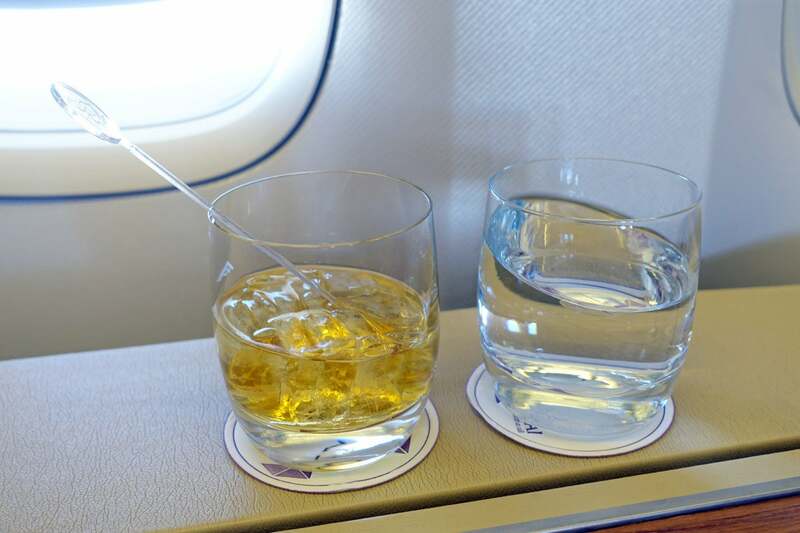 Then, after departure I requested a glass of Johnnie Walker Blue. I’m not sure I’ve ever seen Johnnie Walker Blue airplane miniatures, and Thai didn’t have any here — the crew had opened a brand new bottle just for me. 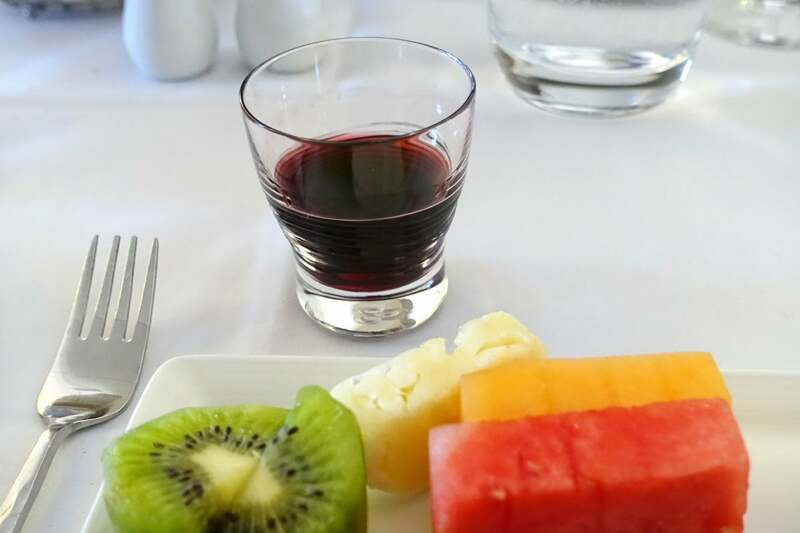 A few minutes later, a flight attendant appeared with the two red wine choices (outlined above). 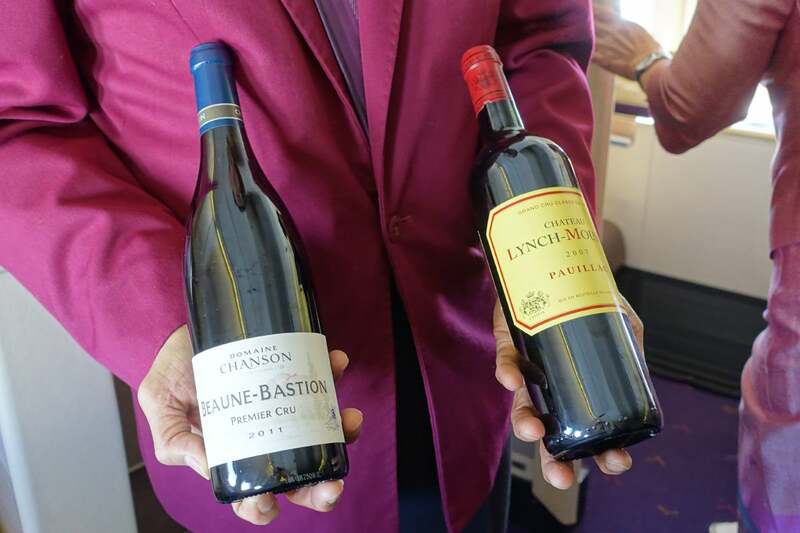 After he noticed that I had been documenting the experience, the flight attendant kindly offered to leave the wine behind for a photo (compare that to my experience on American Airlines…). At the same time, another FA brought a trio of appetizers (smoked salmon, king crab and a meat/fruit skewer) and a bowl of macadamia nuts. 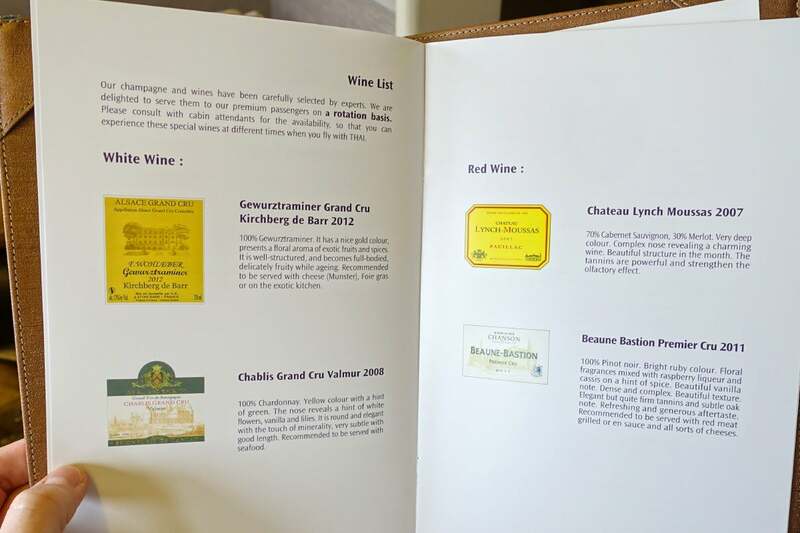 The first-class menu was presented in a leather folder, with the first and second meals — let’s call them “lunch” and “lunch” — listed side-by-side at the center of the booklet. 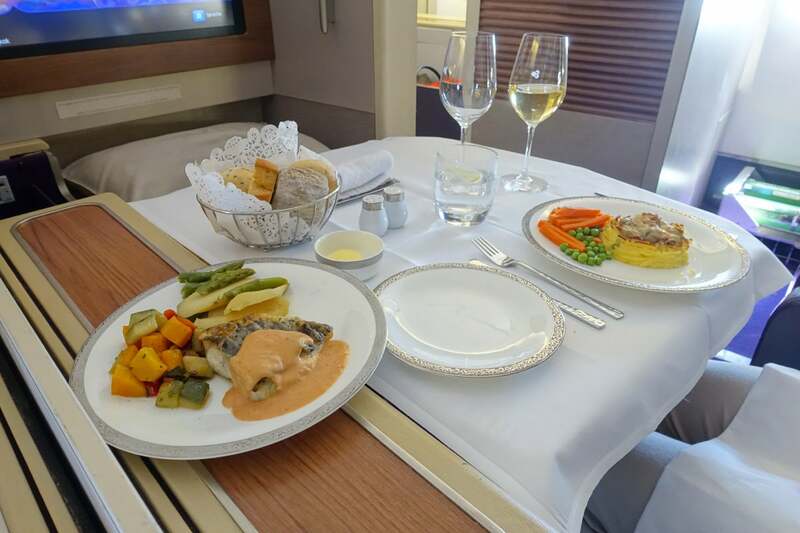 Lunch was served in seat 3E, with my friend in 3F. 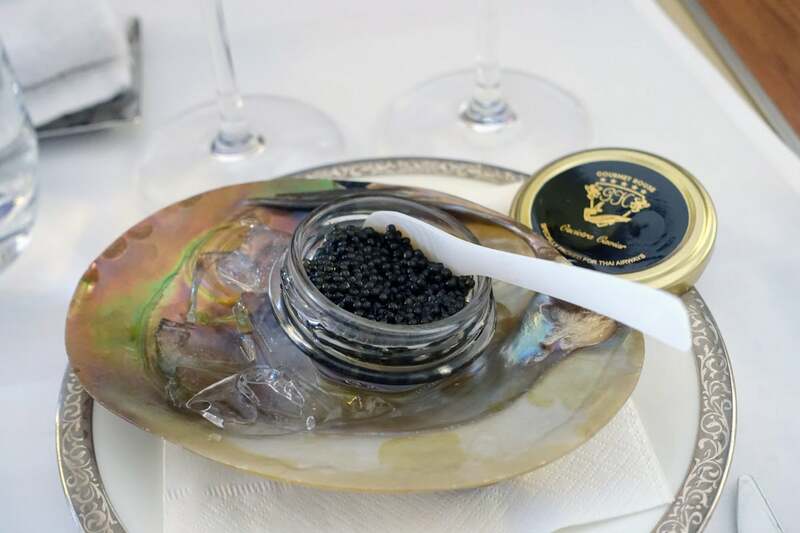 I requested a glass of Chablis to enjoy with my caviar. 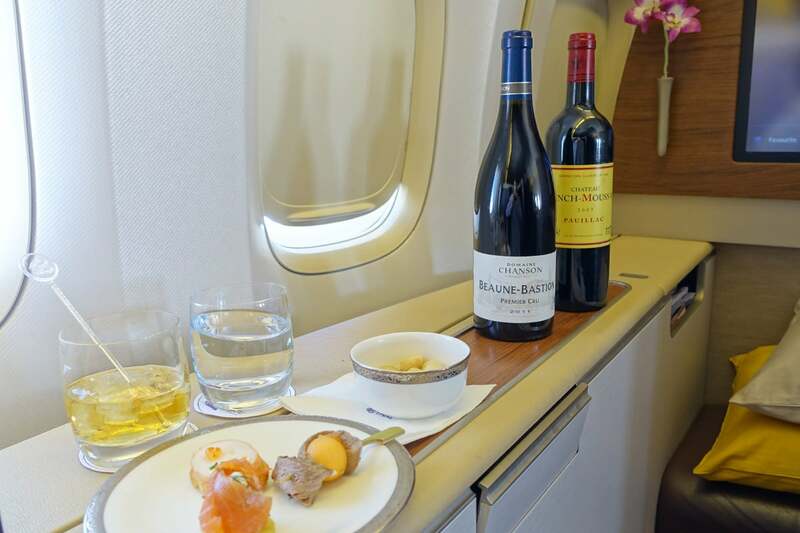 Pajamas, fancy wine, caviar, Dom Perignon, a huge seat in the nose of a 747…. all for 40,000 United miles. Does it get much better than this? 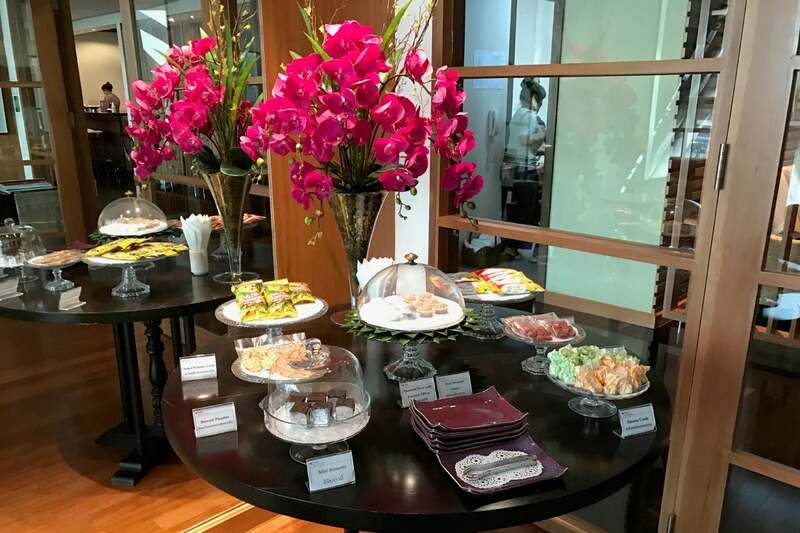 The caviar was served with all the traditional accompaniments, but — and this is me being super picky — I would have much preferred blinis over the Melba Toast Thai serves. The presentation was spot-on though… we each got a full jar of caviar, and a porcelain spoon. 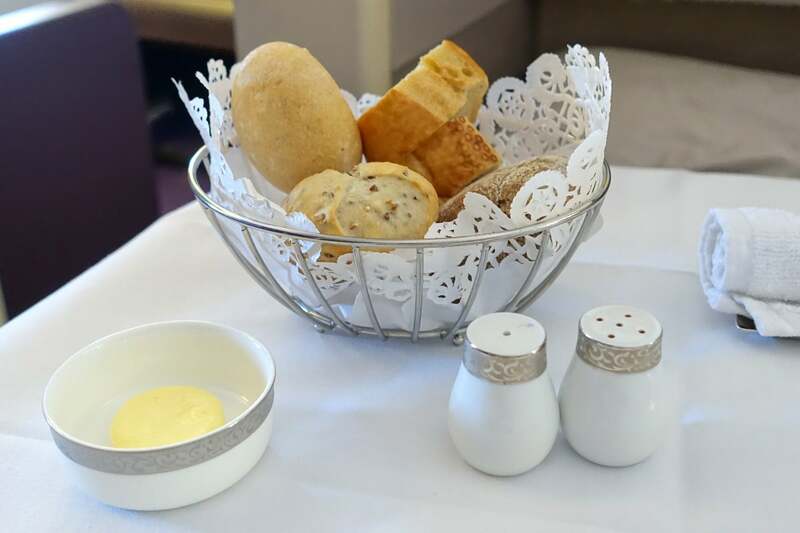 I also got a basket of bread (like, there was way too much bread), a butter dish and leave-them-on-the-plane salt and pepper shakers. 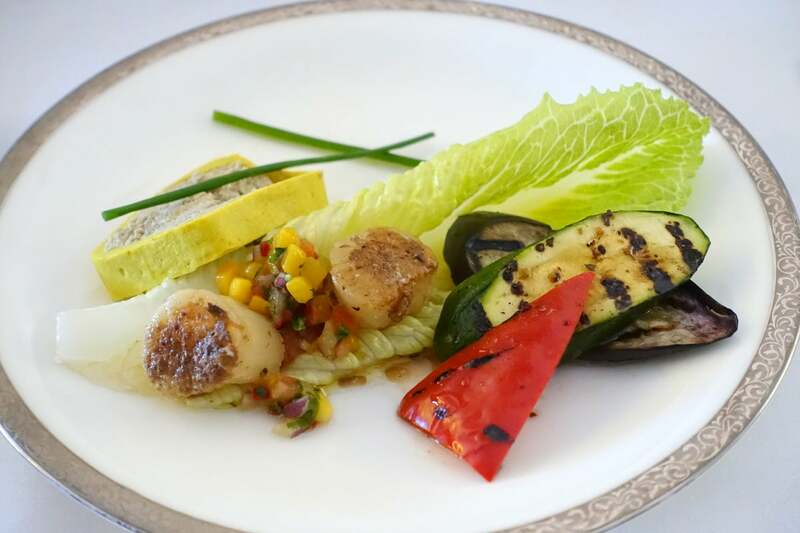 After all that, it was time for the first course of duck liver terrine, grilled scallops and veggies. The scallops were a bit tougher than I would have liked, and they weren’t terribly flavorful. The veggies were a bit bland as well, and I decided to pass on the liver. 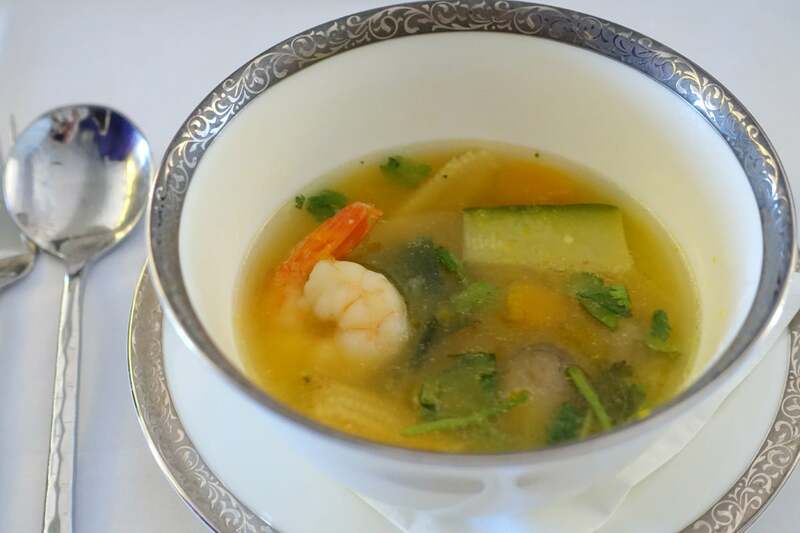 Then it was time for the only Thai dish we ordered (there wasn’t much available) — Kaeng Liang Goong Sod — a spicy mixed vegetable soup with prawns. It was fantastic. 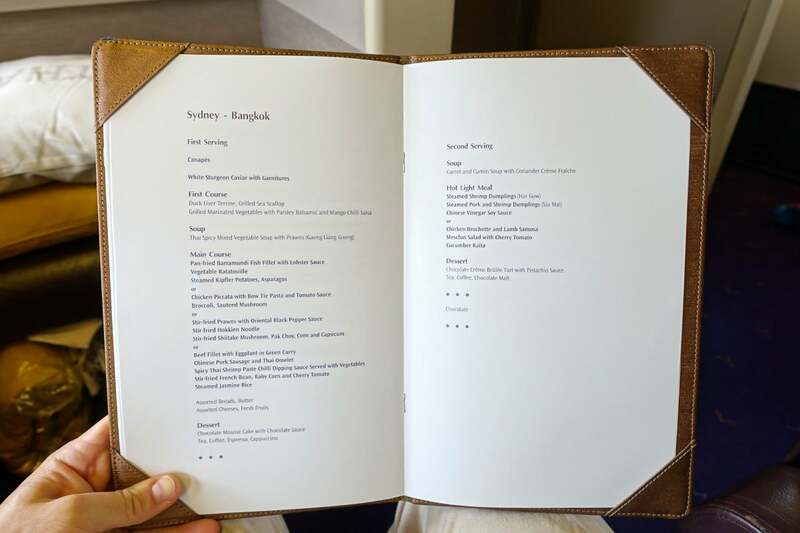 We actually ordered our main course ahead with the Sydney reservations team before the flight — first-class passengers can request any of the items listed here. 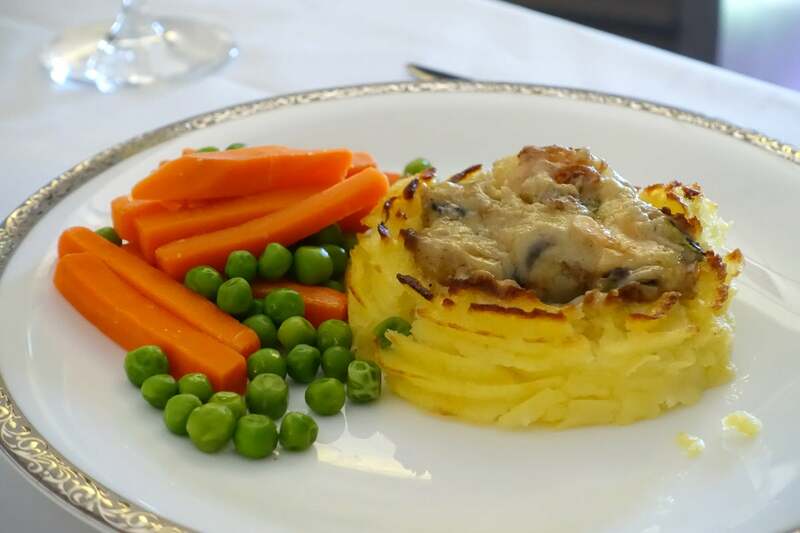 I sent an email requesting lobster thermidor with duchess potato and vegetables, and Coquille St. Jacques (scallops) with duchess potato and vegetables, and the airline responded with our confirmation in just two hours. 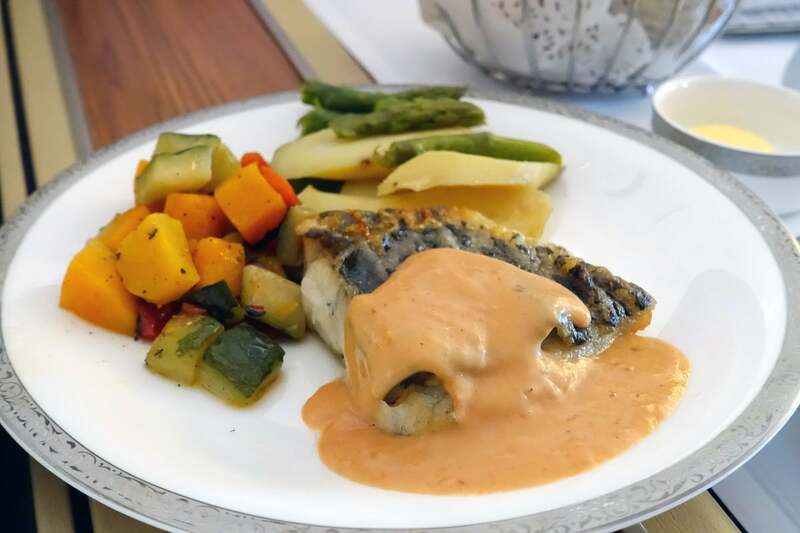 Of course, given that the flight was catered for nine first-class passengers, there was plenty of other food available, so I requested the pan-fried barramundi filet with lobster sauce so we could give that a try, too. First up was the scallop dish. I liked the potatoes, but the scallops were prepared in a heavy cream sauce, which I didn’t love. The carrots on the side were a bit overcooked, too. 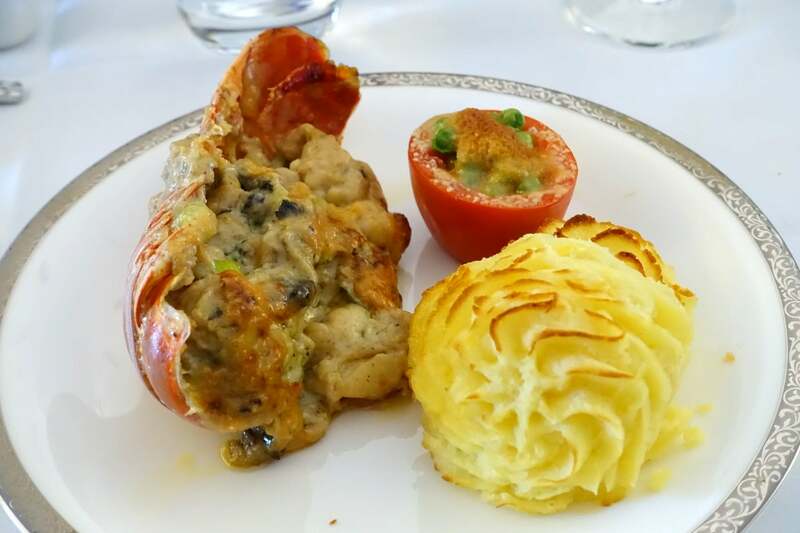 The lobster thermidor has a surprisingly similar taste to the scallops — if it weren’t for the lobster shell, I probably wouldn’t have been able to tell the difference. This dish had the same potatoes, too, plus a stuffed tomato. The fish filet was actually my favorite, so maybe don’t bother ordering ahead? The veggies were overcooked here as well, but the fish wasn’t overdone, and the lobster sauce was delicious. I’d say overall the entrees were a bit of a miss, but there was so much other great food available that I didn’t mind much. 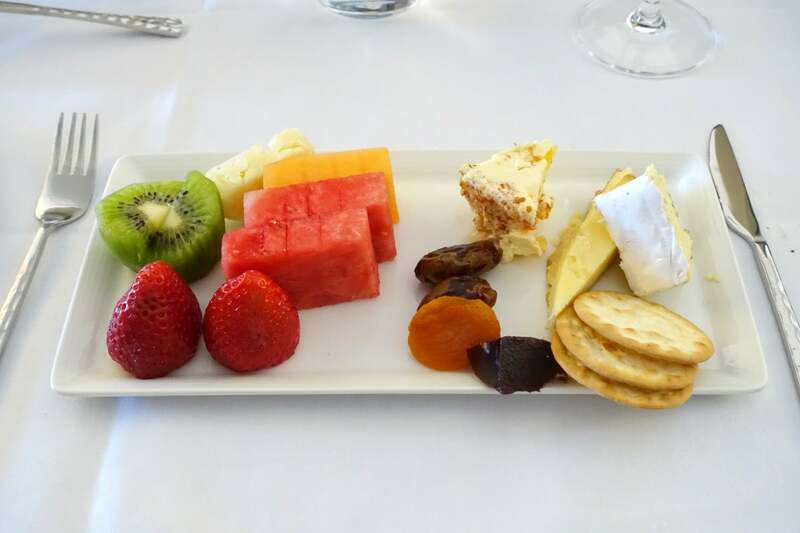 The fruit and cheese plate below, for example, was fresh and delicious. I also requested a glass of port, which was served in a tiny glass. 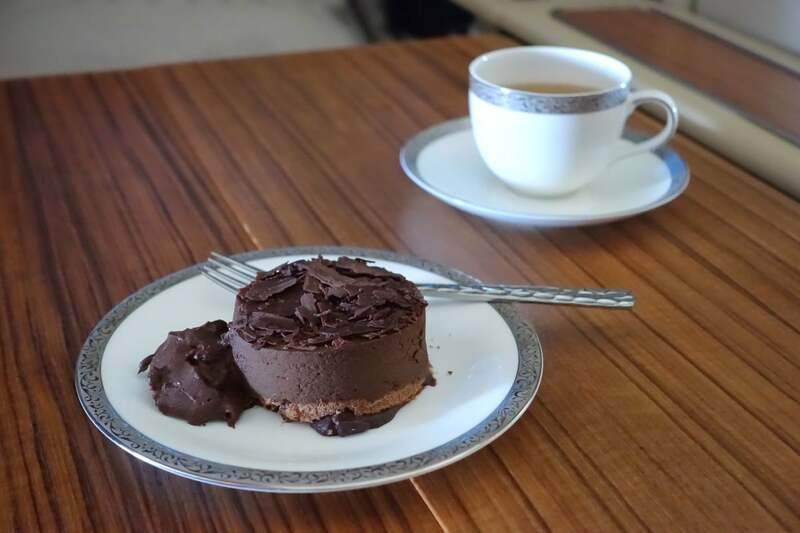 Finally, I had the chocolate mousse cake (delicious) and a cup of tea for dessert. 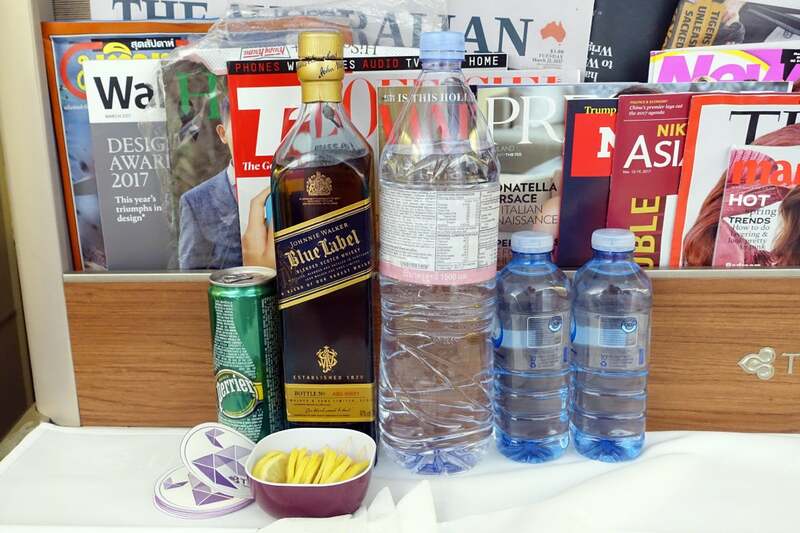 Later in the flight, I pressed my flight attendant call button and ordered a second glass of Johnnie Walker Blue (they had already opened the bottle just for me, after all), and a sparkling water. Both arrived at my “bedroom” (2K) within a few seconds. Roughly 90 minutes before landing, it was time to head back to our third-row dining facility for our second lunch. 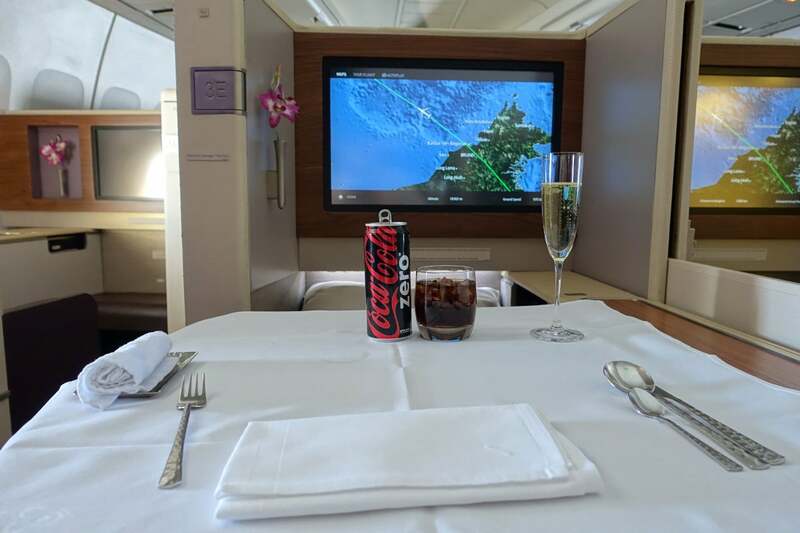 I started that off with more Champagne and a Coke Zero. 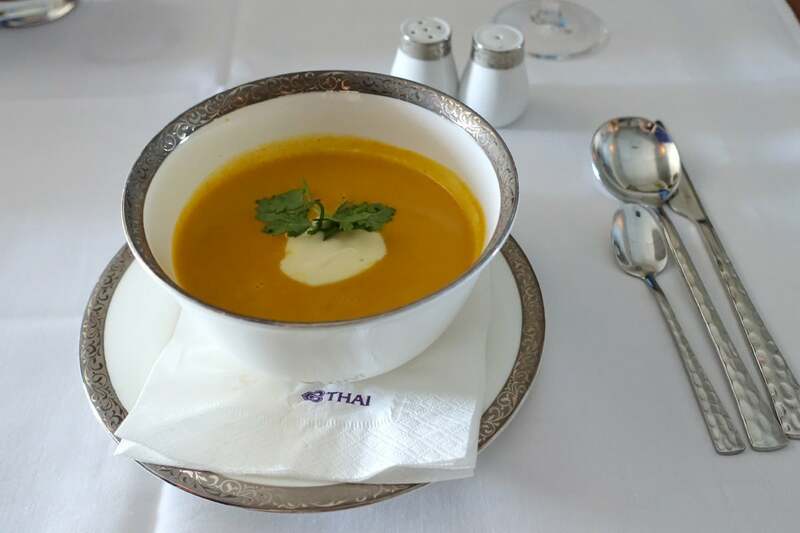 The first course was a fantastic carrot and cumin soup. 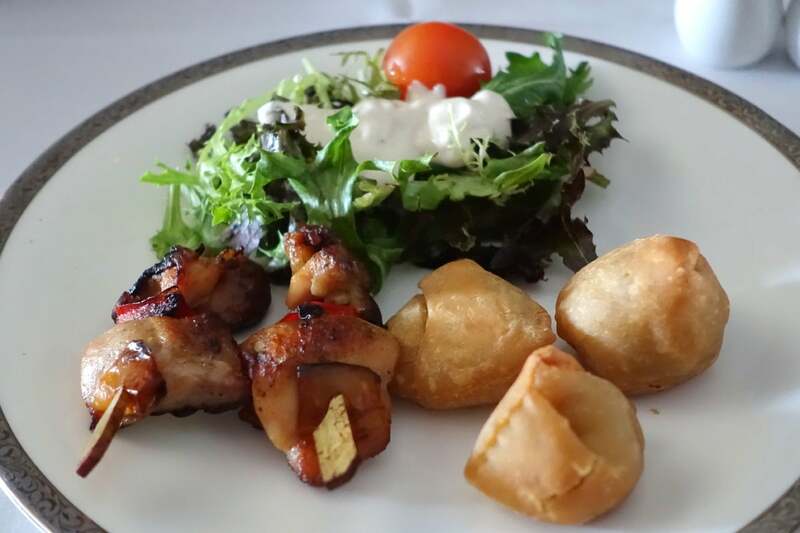 For my “light meal,” I selected the Western option of chicken skewers and lamb samosa, which was served with a salad. The dish was certainly not memorable, but it was filling. 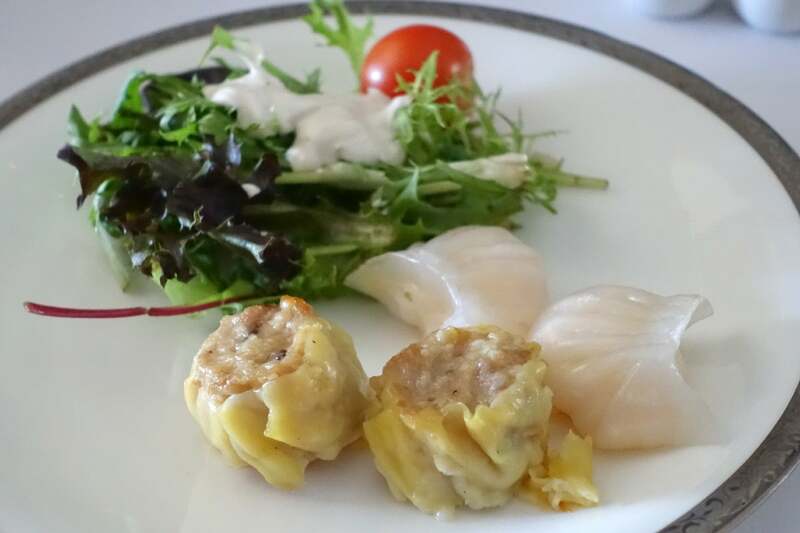 My friend got the steamed shrimp and shrimp/pork dumplings, which were served with the same salad. These were better, but the dumplings were overcooked. And don’t you worry… there was another dessert. 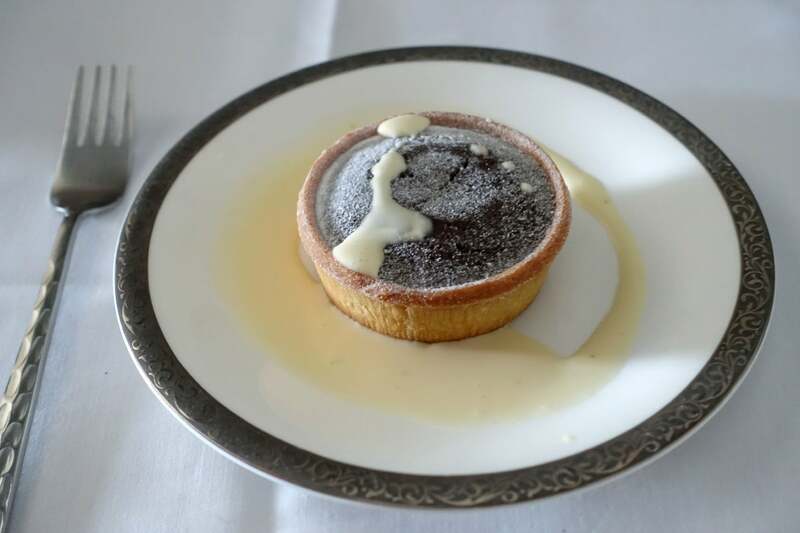 This time it was a chocolate creme brulee tart with pistachio sauce, which I loved (even though it was a bit dense). 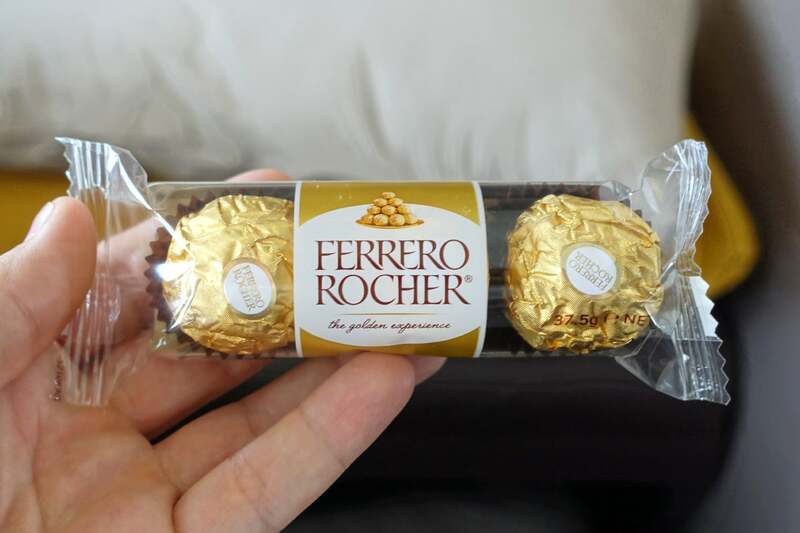 Then, after I returned from changing in the bathroom, I noticed a small package of Ferrero Rocher chocolates at my seat. 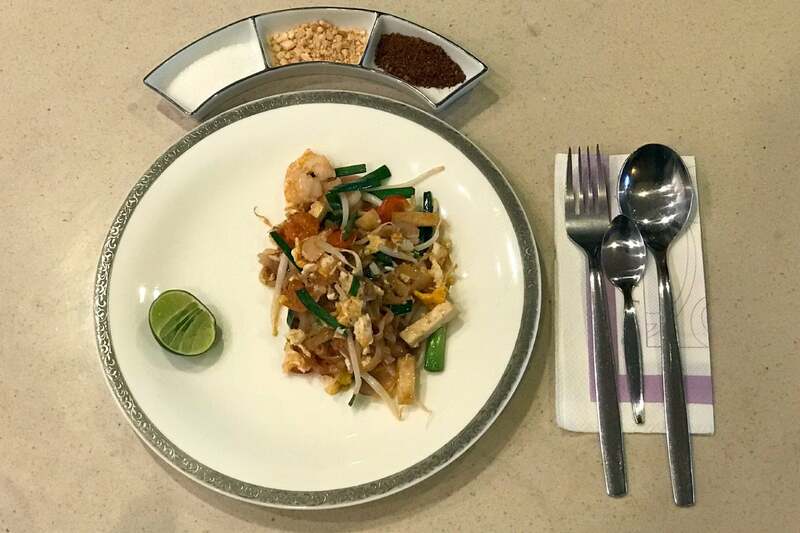 Overall, Thai’s catering is decent — I think it’s sufficient for first class, but perhaps not competitive with the very best carriers, such as Asiana and Singapore. 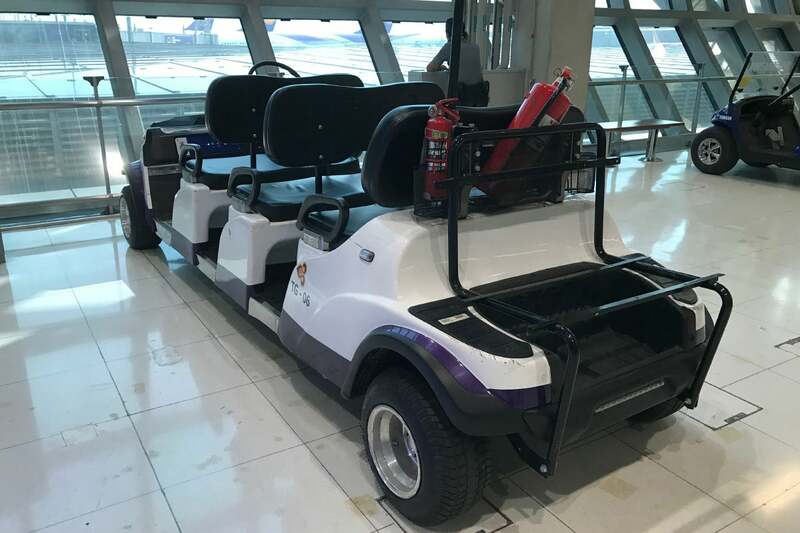 About 20 minutes before landing, the in-flight entertainment was interrupted for a video offering BKK arrivals info, at which point I started to get pretty excited about the “buggy” ride and complimentary hour-long massage to come. There was an airport agent waiting for us just outside Door 1 when we deplaned. She escorted us to a waiting buggy, drove us to a security checkpoint, and even assisted with the screening. An airport security agent ended up flagging my battery pack for additional screening. BKK only permits power banks of up to 32,000 mAh (which is relatively gigantic). Mine was far smaller, but it didn’t have the mAh listed on the packaging, so I had to prove its capacity (by pulling up a specifications page on my phone) before being allowed to pass through the checkpoint. 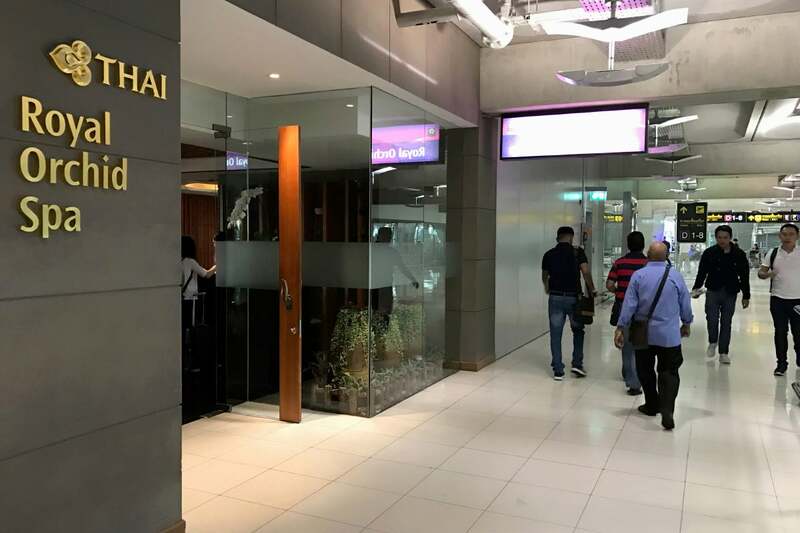 A couple minutes after that we arrived at the Thai Royal First Lounge (which we were permitted to use even though we were connecting to a business-class flight). 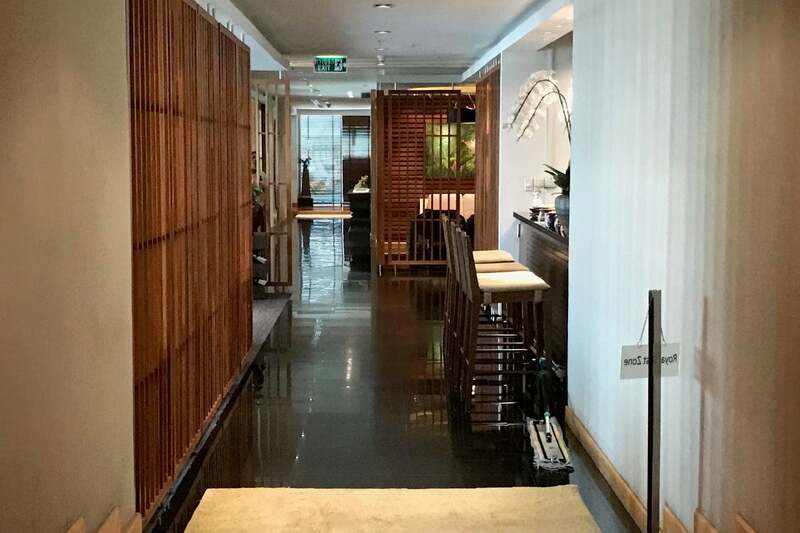 The lounge agent made an instant “appointment” for an hour-long foot and neck/shoulder massage, then walked us across the hallway to the Royal Orchid Spa. 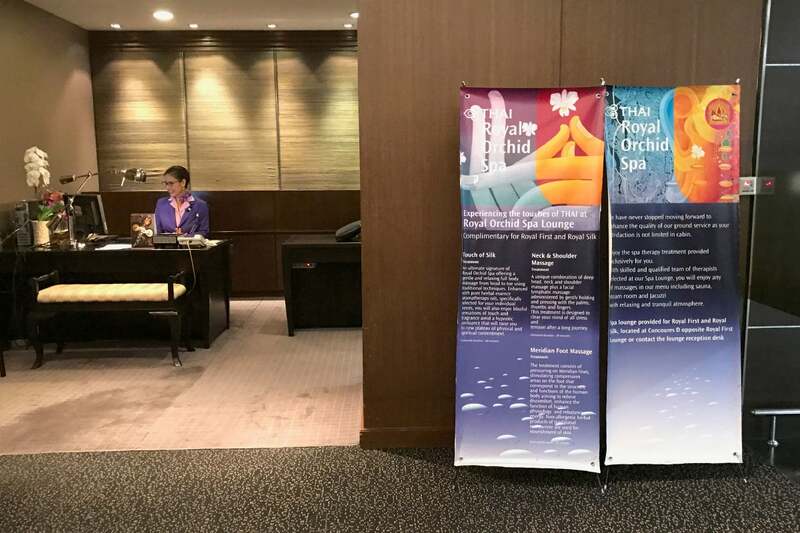 The Royal Orchid Spa is accessible to business and first-class passengers — business passengers can get a free 30-minute massage, while first-class passengers can get free massages totaling an hour. 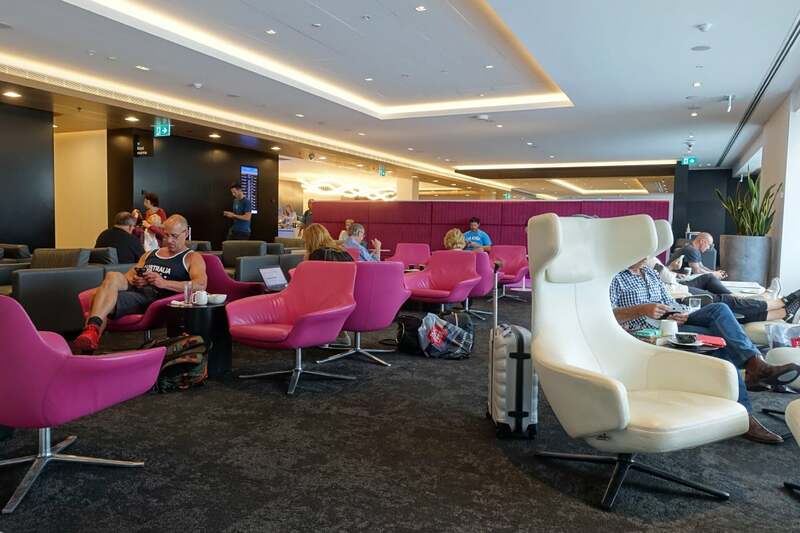 It’s a fantastic service, and fortunately we had enough time to take full advantage during our two-hour layover. 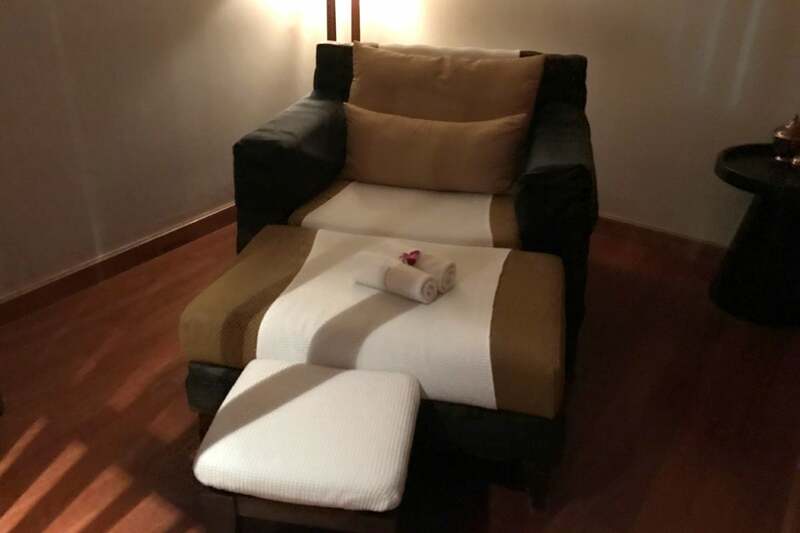 I’ve never gotten a full-body massage here, but the foot massages take place in a semi-private space. 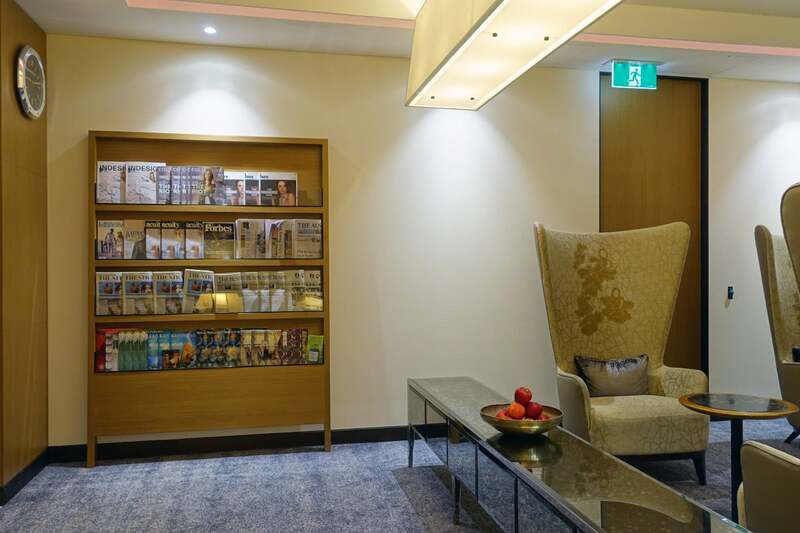 It’s a bit nosier than a regular spa, thanks to airport announcements and the occasional inconsiderate traveler, but it sure beats passing the time out in the terminal. 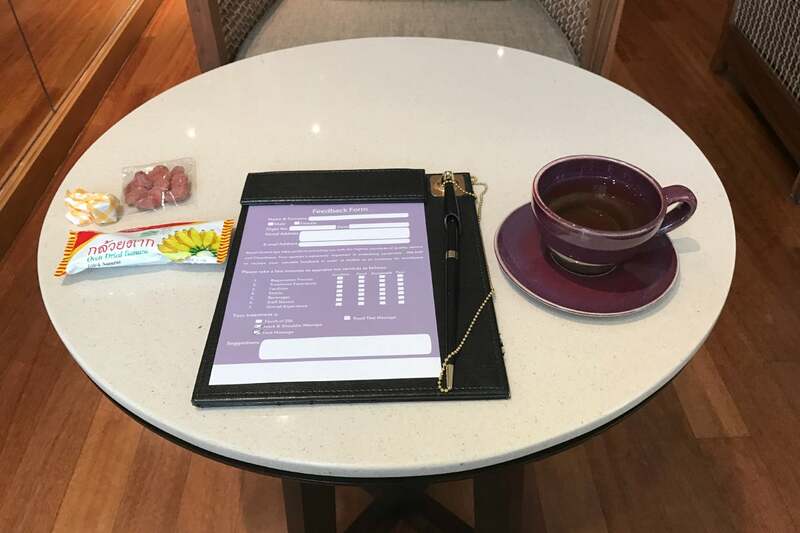 After our massage(s), we were taken to a first-class waiting area with a small selection of snacks. We were also served hot tea (ginger or lemongrass) and presented with a survey. 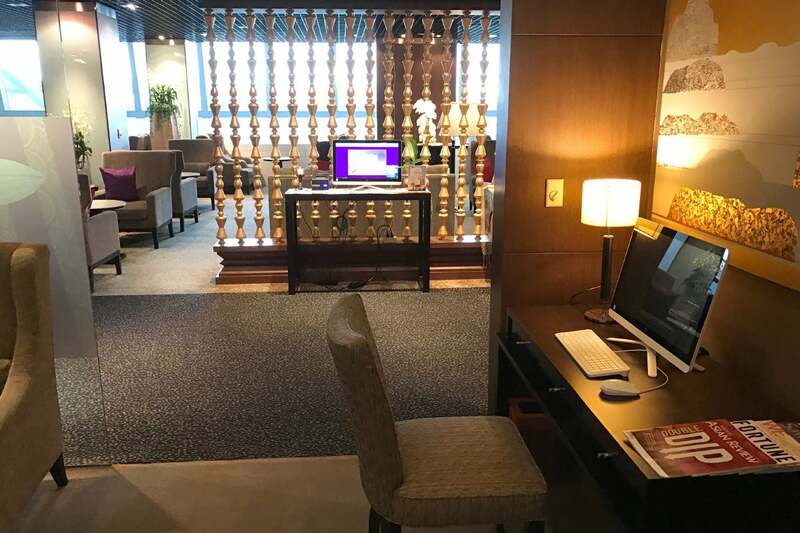 After that, we walked ourselves back over to the first-class lounge, where we were immediately recognized and showed inside to a private room. The lounge has a handful of private living room areas, complete with a sofa, chairs, a TV and a desktop computer. There was a large selection of alcoholic and non-alcoholic beverages. 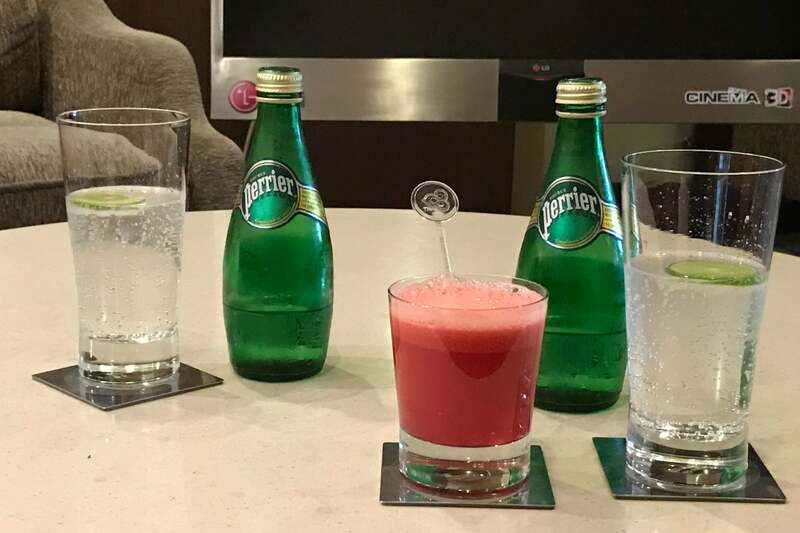 Given that we’d just come off a nine-hour first-class flight, it was time to detox with some sparkling water and fresh watermelon juice. 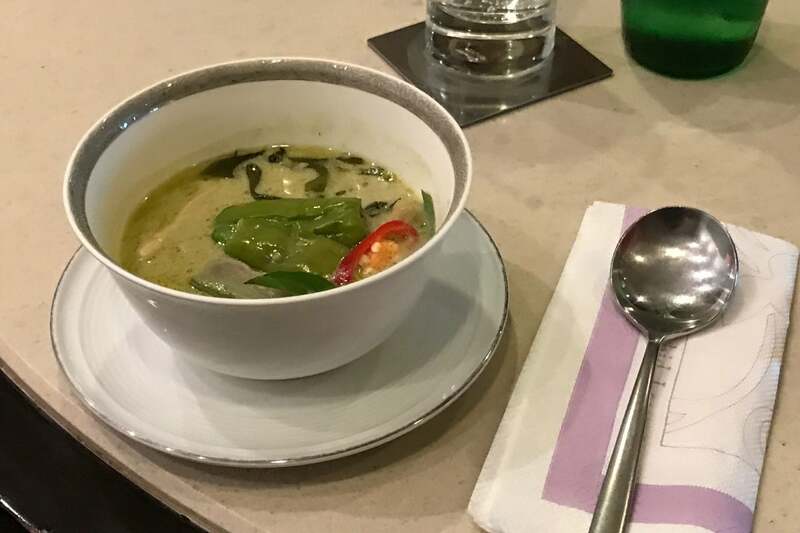 I also ordered a green chicken curry so I could give that a try (it was very good). My friend ordered pad thai, which was pretty good (but not exceptional). 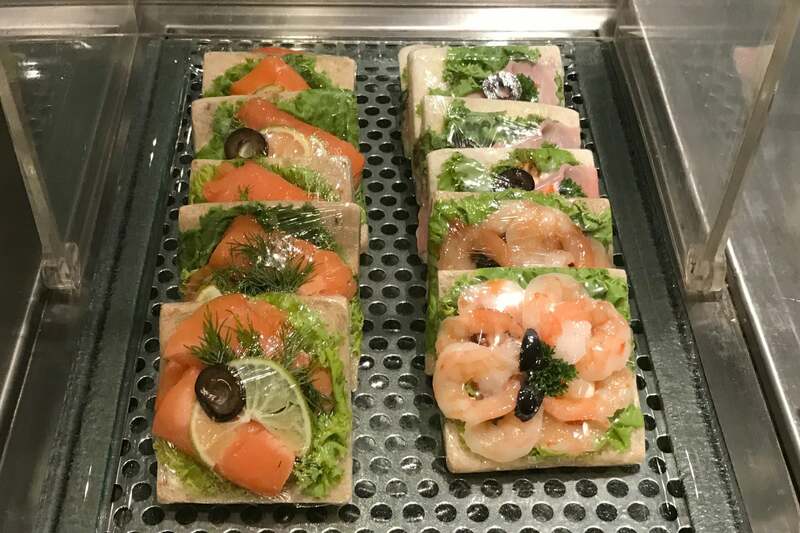 There was plenty of other food to choose from, ranging from hot items (from the kitchen) and cold items such as the sandwiches below (from a buffet). The lounge was very quiet overall, but the dedicated dining area (which I hadn’t noticed on my last visit) was entirely deserted. 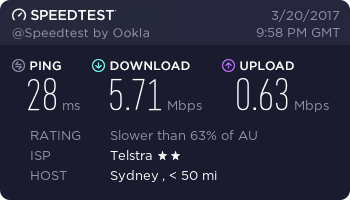 I also took a few minutes to catch up on email — the Wi-Fi performance was decent, but hardly exceptional. 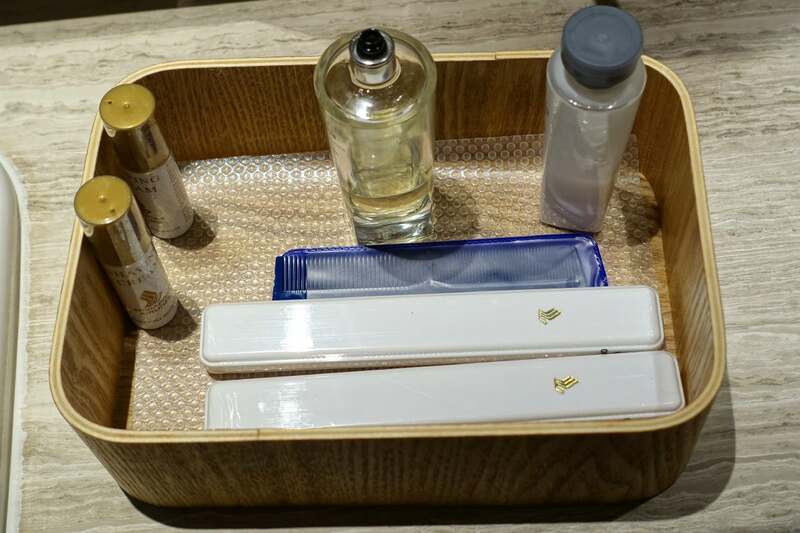 Thai’s first-class product is great overall, but it’s hardly the industry’s best — of the products I’ve tried, in my opinion, that honor might go to Asiana or Etihad — but this is, hands down, the absolute best award redemption I’ve come across. 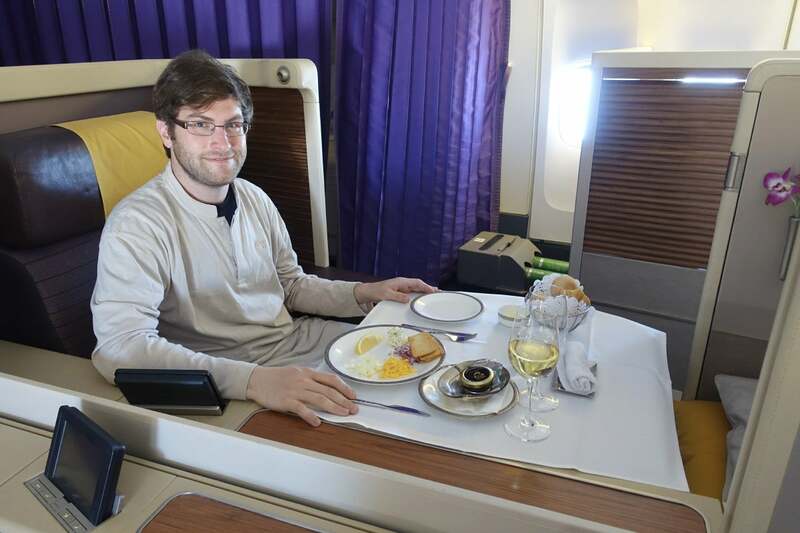 I mean, seriously… just 40,000 United miles (or Chase points) for this incredible experience? That’s unreal! 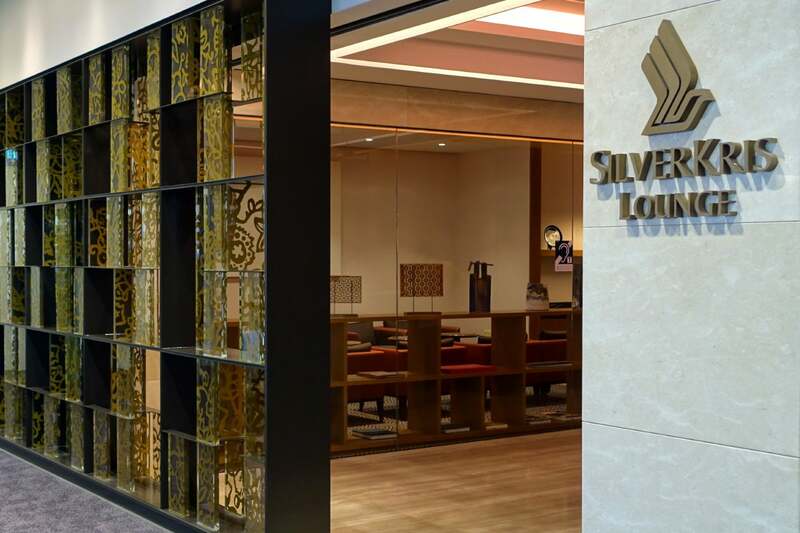 And the fact that you can book this with the points you’ll earn with just one credit card offer (from the Chase Sapphire Preferred card) makes it accessible to countless travelers —including those who have never flown with United. 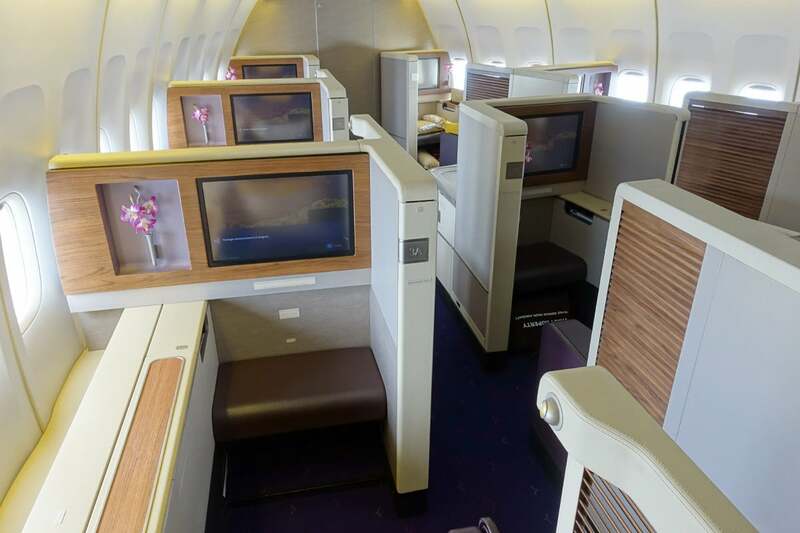 The only challenge here is that you can only book Thai first class at this rate on flights between Southeast Asia and Australia or New Zealand. 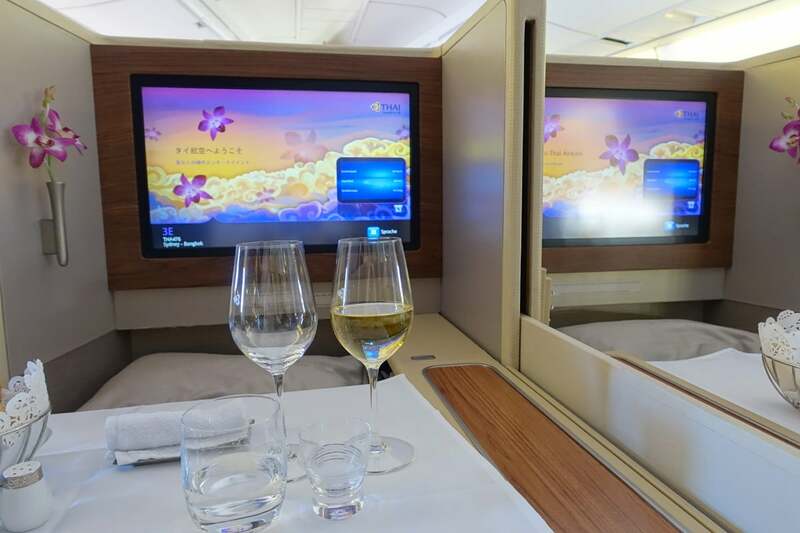 That makes it a great fit as one portion of a round-the-world trip, but if you’re based in North America, you might not have much need to fly between these two regions (which is likely why United continues to offer this award for just 40,000 miles). 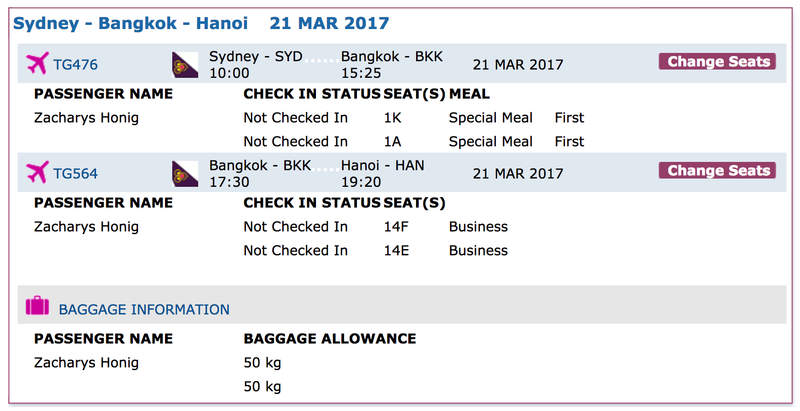 Still, if you can make this nine-hour flight between Bangkok and Sydney work for you, don’t hesitate to book it. 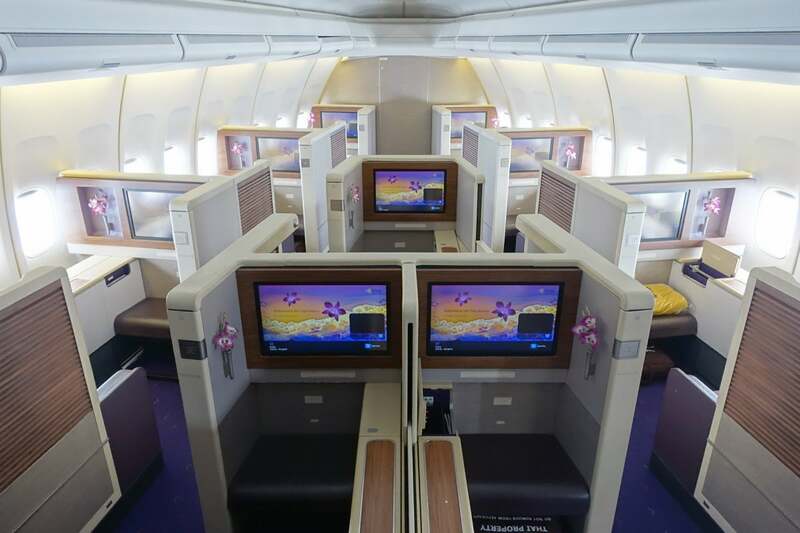 What’s your best premium-cabin award redemption? Let us know in the comments, below.